In the popular graduation song Find Your Wings, Mark Harris sings, “It’s only for a moment you were mine to hold…” Our day to day parenting of our third son, Logan, is quickly coming to an end. In little over one month, Logan will be returning to the United States to begin the next chapter of his life. His leaving the island is bittersweet. Bitter in that it means we are losing the day to day companionship of a wonderful son and huge help in everything techy (for us as well as the ministry here) and sweet in that it means Logan is getting to begin the next chapter of the life God has called him to lead. As we contemplate Logan’s departure and try to enjoy every day we have with him, we can’t help but thank God for the blessing and opportunity we have had in getting to raise this awesome young man. Yes, he was a trying little soul as a youngster, but God has done a miraculous job in molding and shaping him into a godly man, and we are so proud of him. More importantly, we thank God for Logan’s heart and desire to live a life that honors and glorifies his Creator. 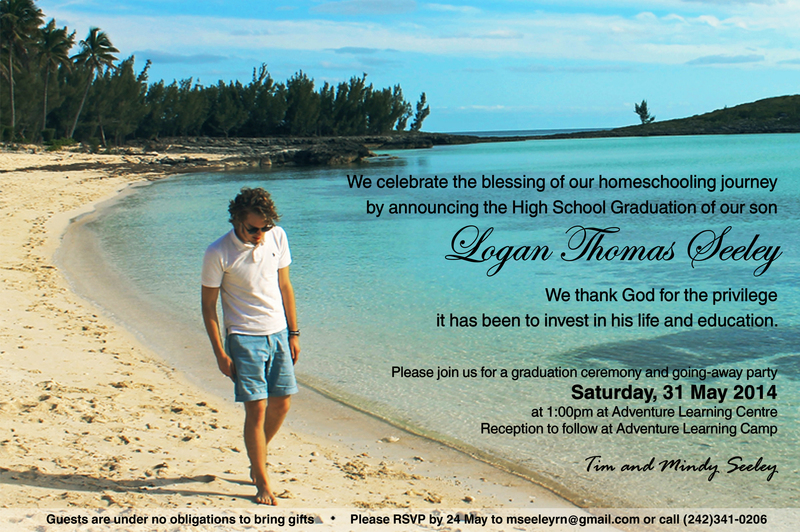 We have planned to honor Logan with a simple graduation ceremony and going away party on Saturday, May 31st here in the Bahamas. We are looking forward to Garrett and his girlfriend Abby Huffman, Grandma and Grandpa Mikels, and Aunt Missy joining us to celebrate this time with us. Of course, anyone is invited to come. Let us know if you are interested. If you are not able to attend Logan’s graduation (and that is probably >95% of you), we would appreciate your thoughts and prayers for him. 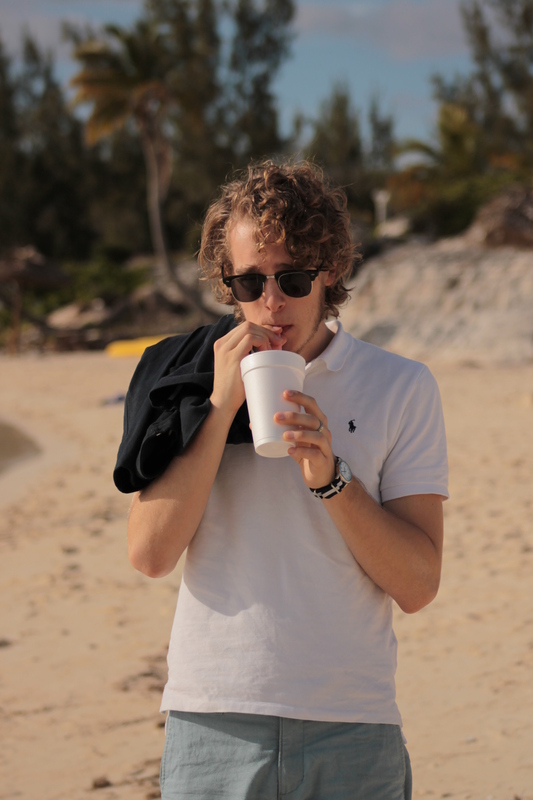 Upon leaving Nassau, Logan will be living with his grandparents and older brother in Minneapolis, Minnesota and will begin attending the University of Minnesota this fall where he will major in Computer Science. Please pray for him in this time of transition. Besides adjusting to college life, he will be coming off a foreign missionfield which will provide its own set of challenges. We have decided it would not be wise for us all to fly back to Minnesota with him, so he will be going back alone. (Not how we would prefer it to happen, but it is the way it must be.) Pray for our hearts as well. We are going to miss him. 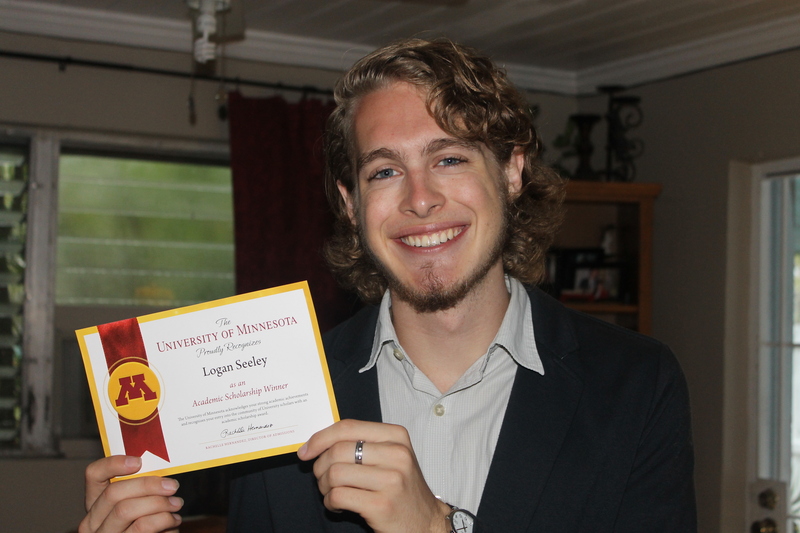 University of Minnesota has decided that Logan will NOT qualify for in state tuition. Wisconsin will not accept him as a Wisconsin resident (which would have qualified him for Minnesota in state tuition) either. This means he will pay $6000 more each year to attend the university as an out of state student. Although this was initially disheartening and disappointing to us, we take it as God’s design for him. We accept it as His perfect will and are confident that He will provide the extra funds needed. 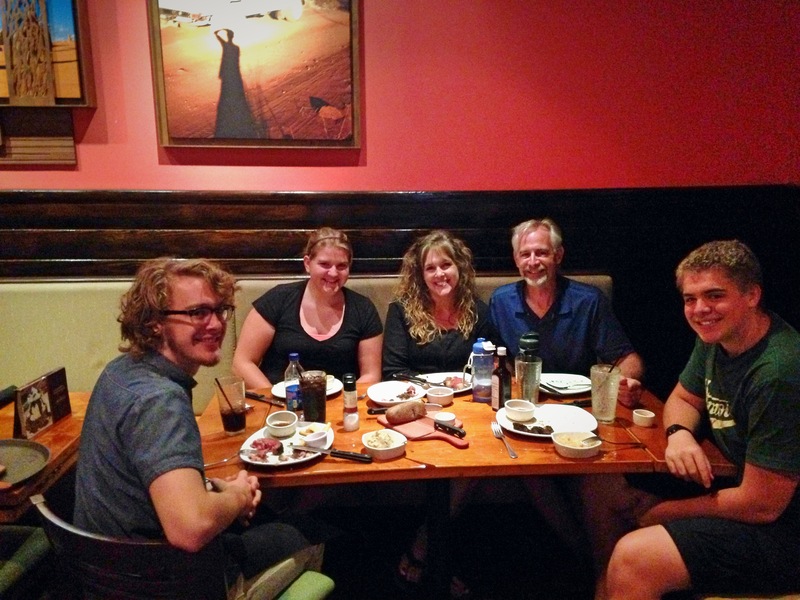 This was suppose to be a blog entirely devoted to Logan’s transition back to the United States, but we thought we would quickly include a picture update as well. Thank you for your interest in our lives and ministry work. 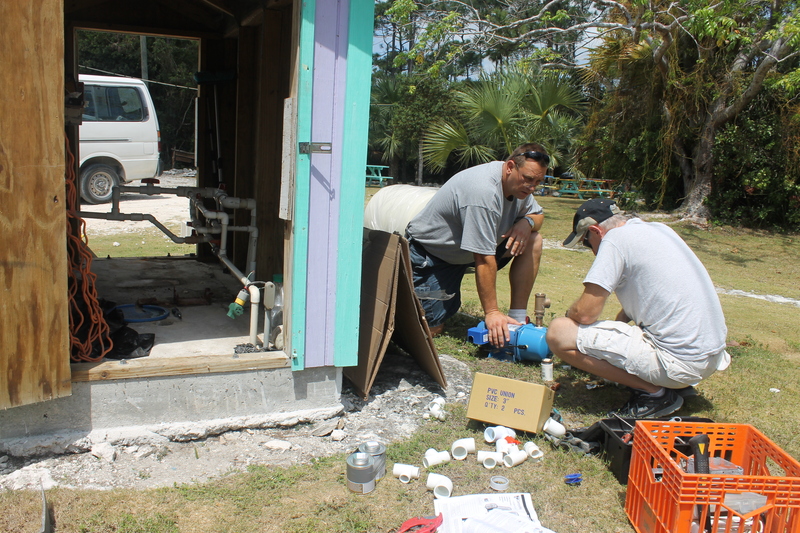 Tom (our maintenance guy) is not able to keep up with all the break downs and maintenance projects here at camp and at the centre because there is just too many things to do, so when the well serving the staff housing/dining hall side of camp quit functioning, Plumber Tim went to work replacing the tank and the pump. 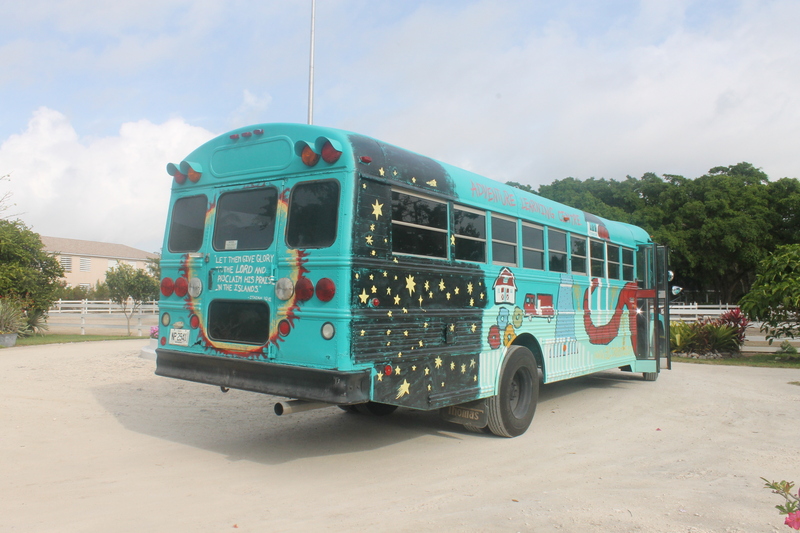 It took several days to complete because of mechanical issues with the new pump/assembly and because we were trying to serve a group at the same time. It is now up and functioning. Praise the Lord. 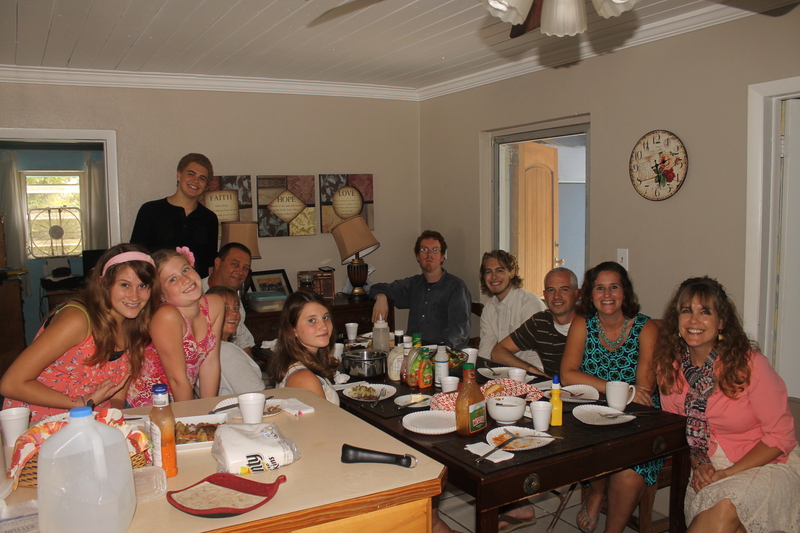 Delhi Alliance Church Mission Team from Delhi, New York came on Friday the 11th. 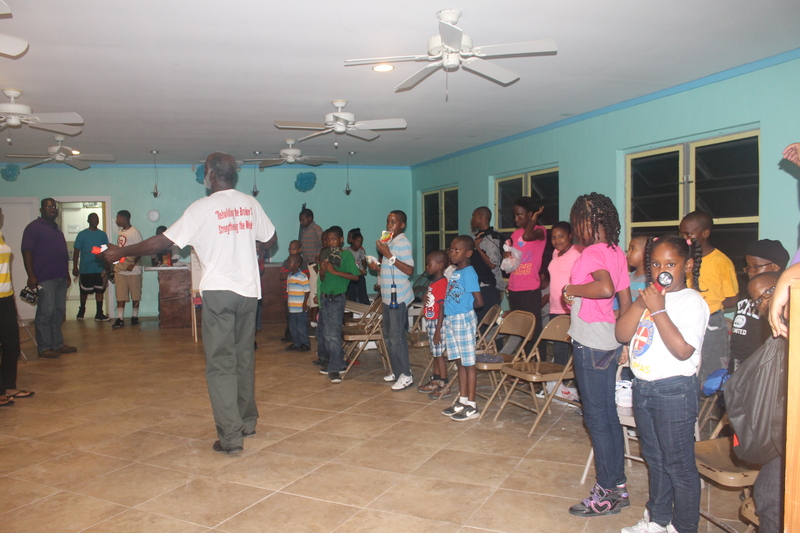 There mission was to serve and bless the ALC&C ministry. They were such a huge blessing to us. 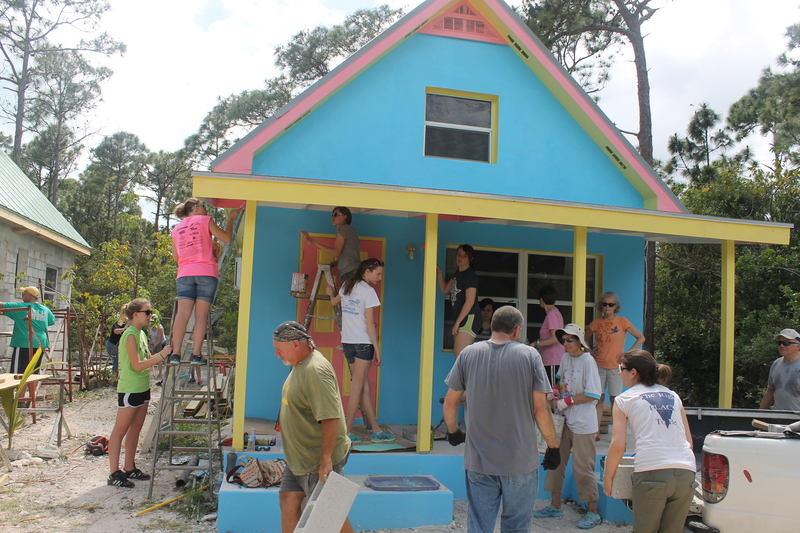 Groups that come here on mission teams usually come and work offsite at other ministries. 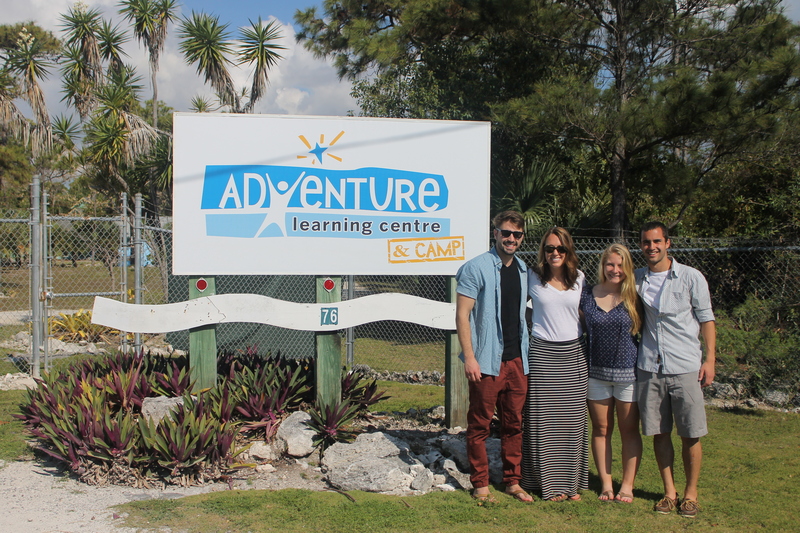 This team (though they did briefly visit All Saints Camp a few days for a couple of hours) ministered at Camp and the Centre. They came along side us and helped lighten our load (a huge timely blessing in that it has been a very busy winter/spring for us). 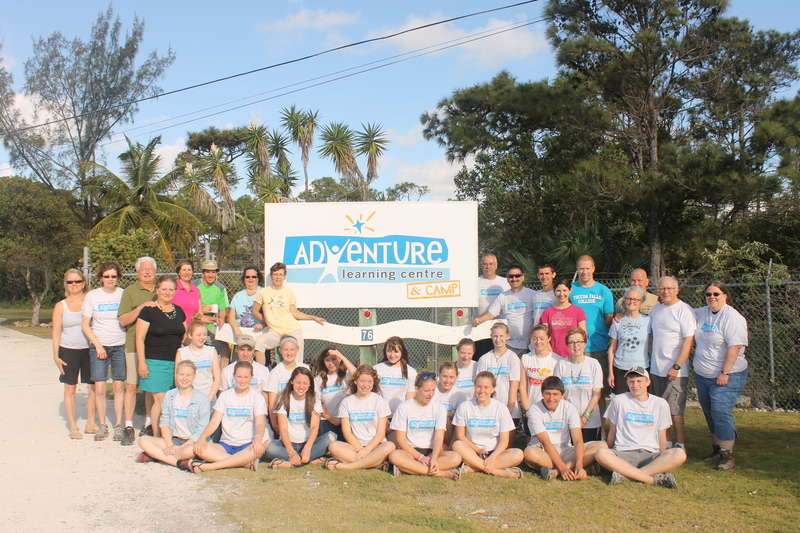 The staff of the ALCentre and Camp appreciate all these people did in helping the ministry here. 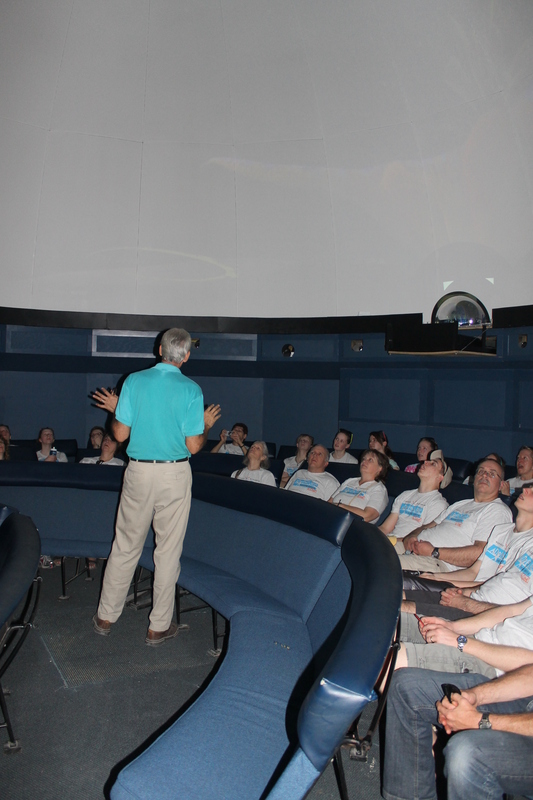 Delhi was treated to a planetarium show at the Centre on the day of their arrival. 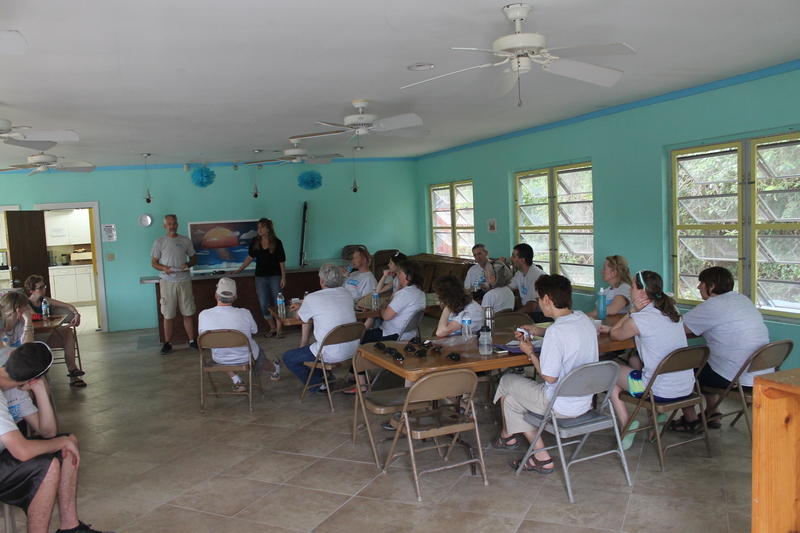 As is customary, we provided a ALC&C orientation to the group. 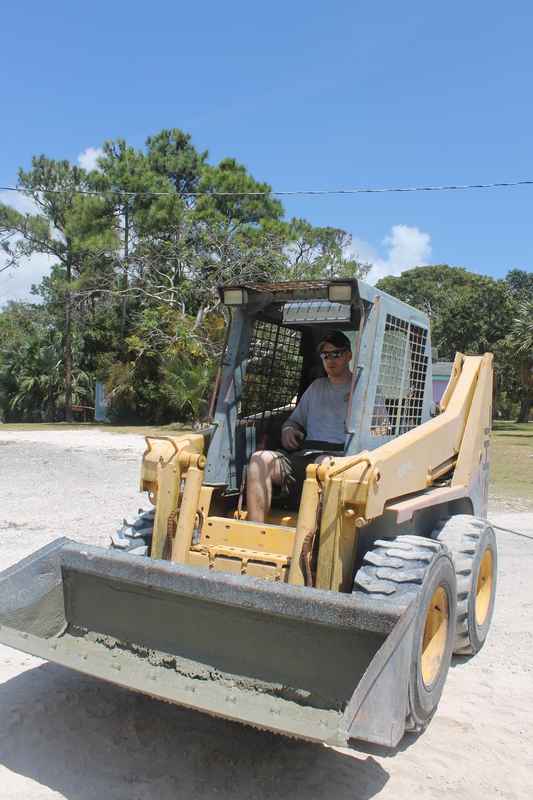 Pastor Keith Wilson got the fun job of operating the Bobcat. 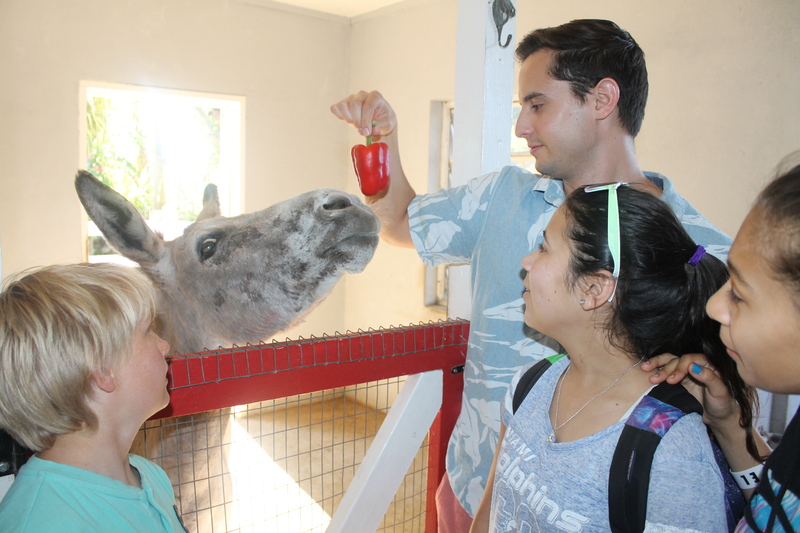 …and of course making new friends. 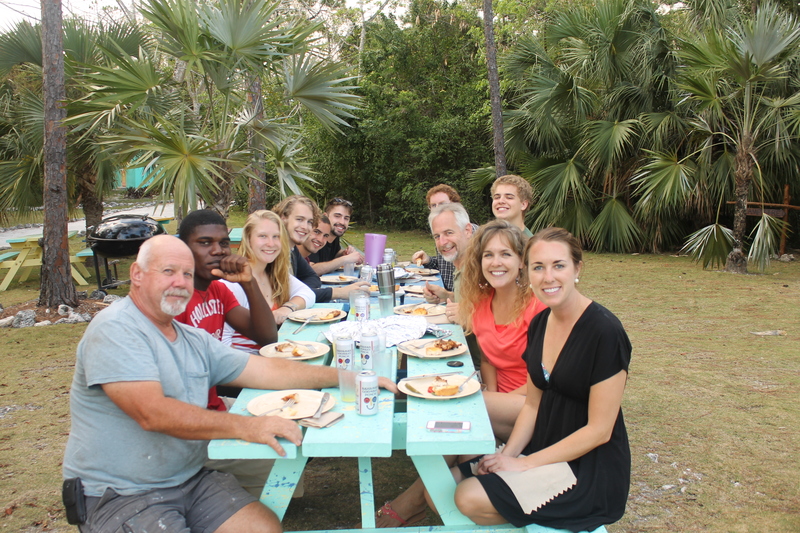 On Wednesday, the group took a day off from work projects and went downtown to shop, eat at the Fish Fry and go to Cabbage Beach. 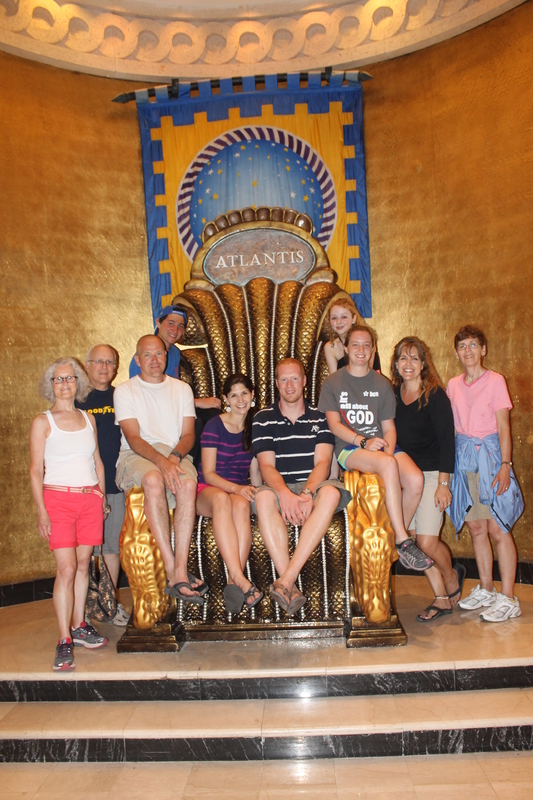 That evening, as we like to do with all our big groups, we (Tim, Zach, Logan and me) split the group into 4 smaller groups to tour Atlantis. Logan with one of his new friends, Ken. This is Marge Hutter. She is from Delhi but came earlier and left later than the rest of the group because she and her husband are still in Arizona where they live for the winter. 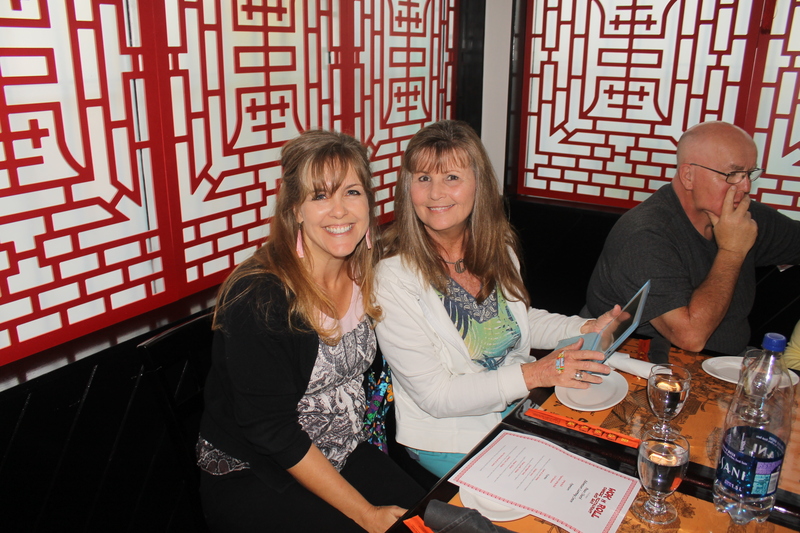 God sends certain people in to our lives to bless and encourage us, this lady is truly a godsend. 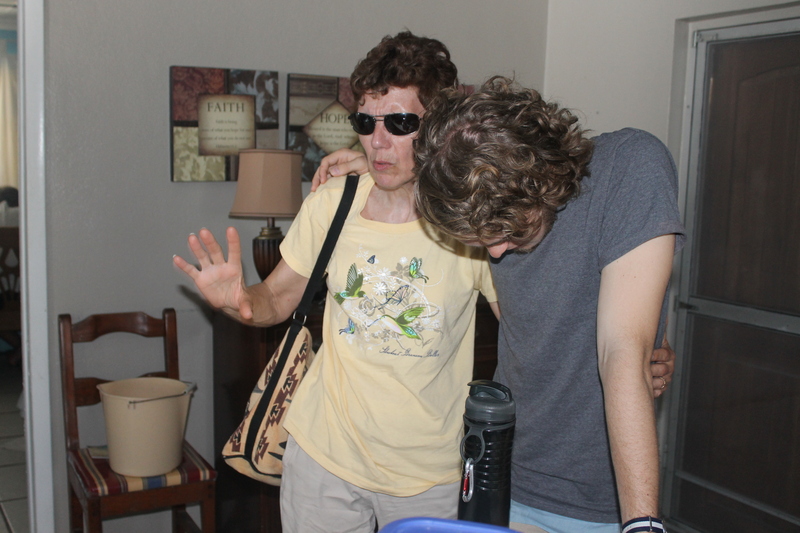 Marge, knowing Logan was going to be leaving soon, took time to pray with him before she left. Tearful (?) 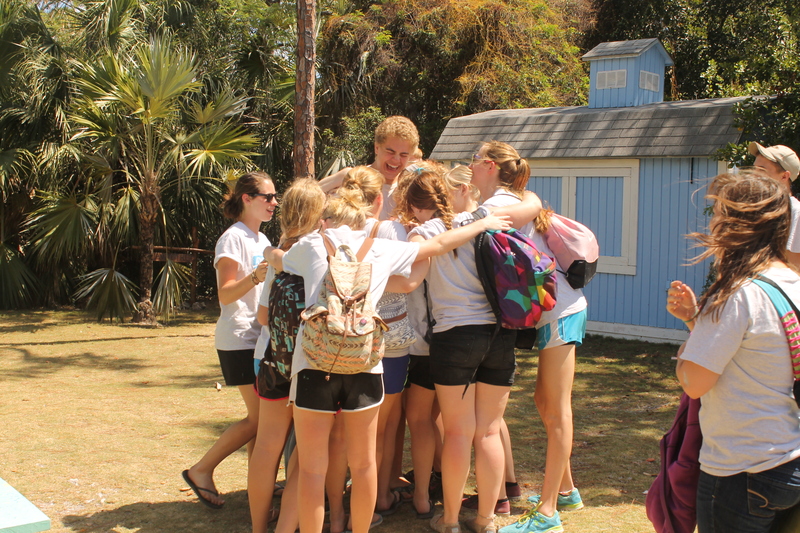 good-byes after a great week of ministry together. 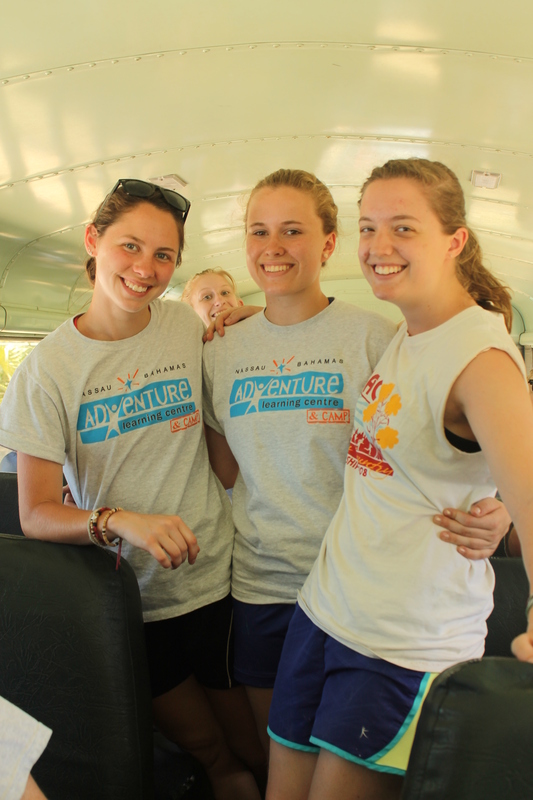 These 3 young ladies have expressed a desire to come to serve at ALC. 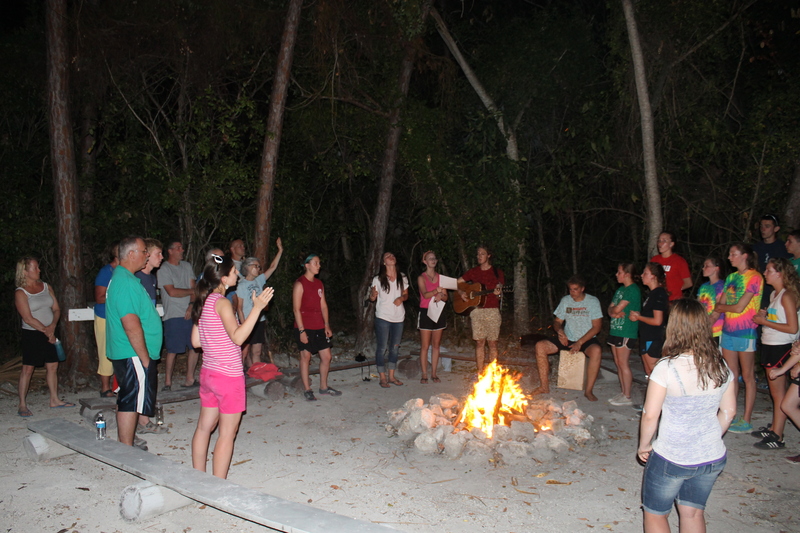 Please pray for them as God works in their lives. While Delhi was here, Boris and Sabrina stopped in for a visit. Boris served in maintenance here back in 2003 and the family lived in the house we currently live in. 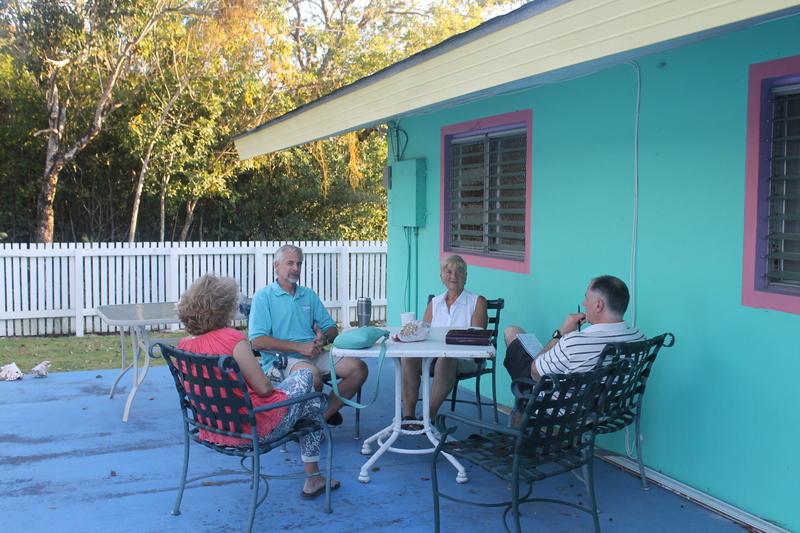 They are visiting Nassau from Switzerland. 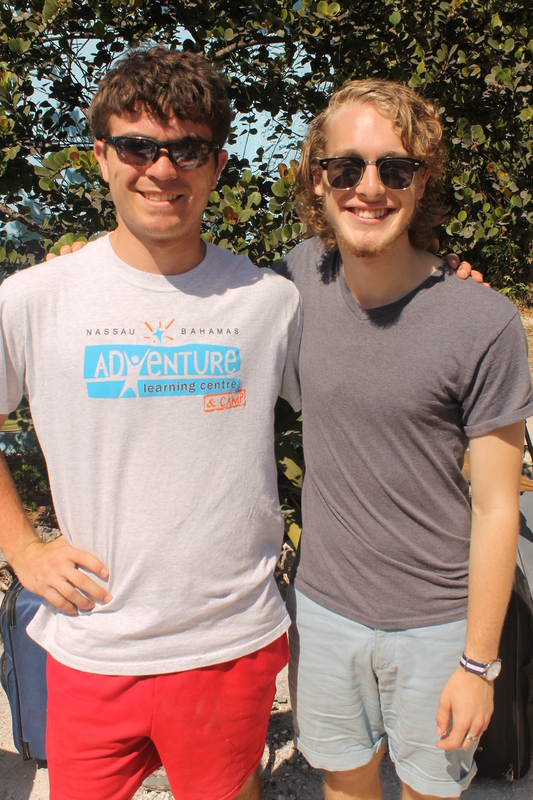 A friend from Tim’s past showed up at camp while in town on a cruise. This is John Fairley from Windsor, Ontario Canada. 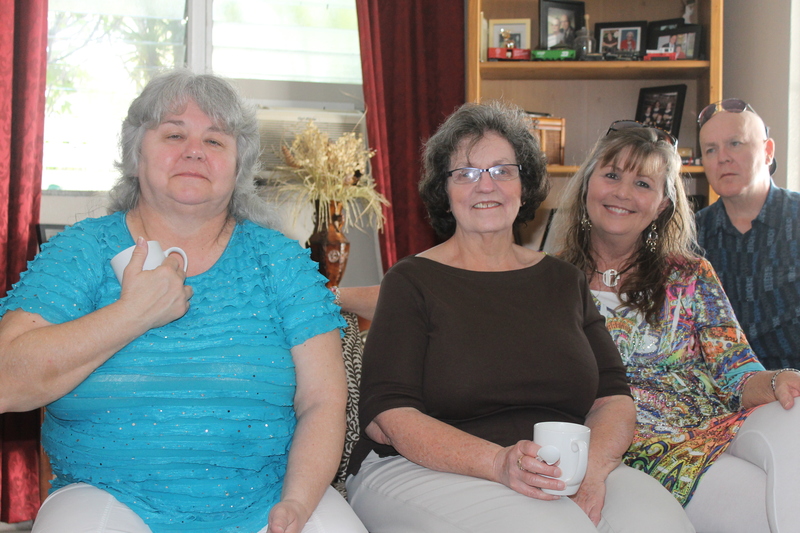 We had a volunteer appreciation get together. 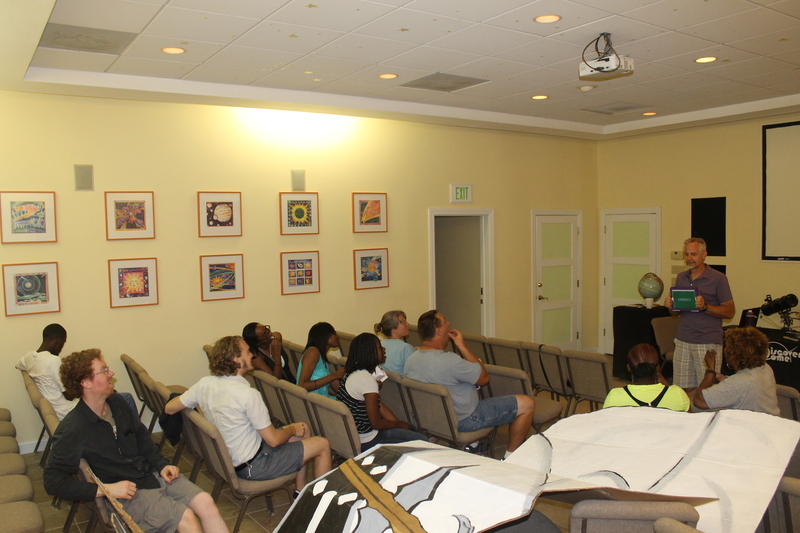 It wasn’t well attended, but those of us who did attend had a great time together. 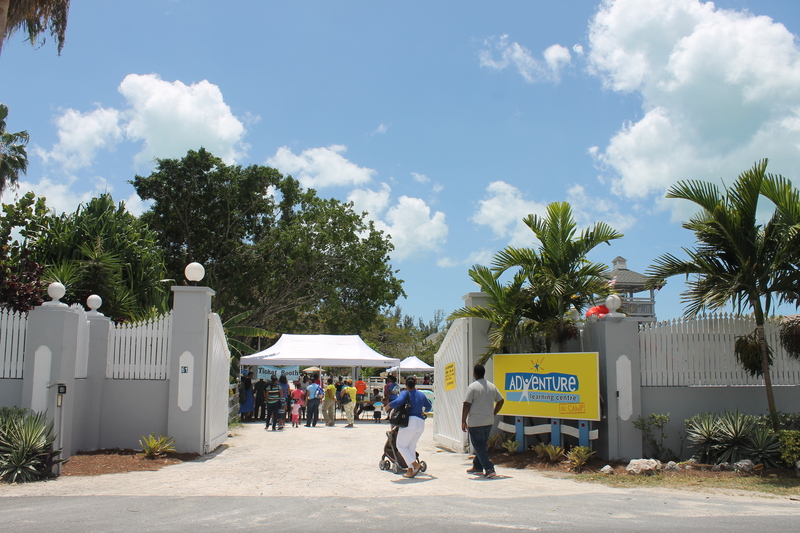 Abundant Life Church’s Boys Brigade had their annual cook out at camp. East Sunday we had the Buntings and Bob and Judi for lunch. 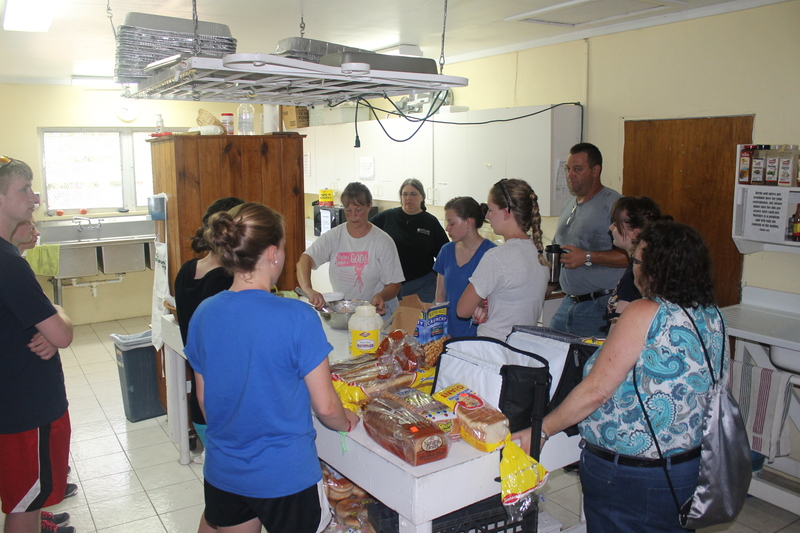 On Sunday evening, we welcomed a group of 4 from Connecticut back to the island to do work with Pastor Wilney Joseph’s church. 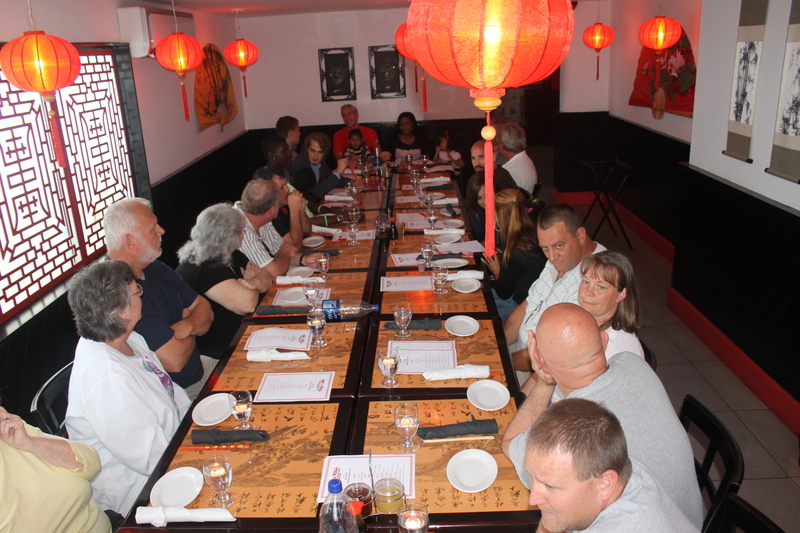 On Tuesday evening we invited the Connecticut group to eat dinner with us. And on Wednesday, they invited us to join them. 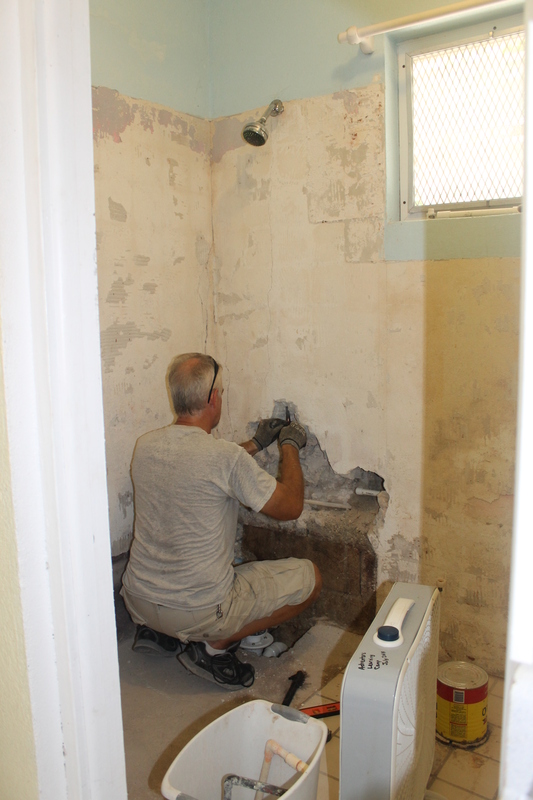 Tim has been working on the camp kitchen apartment shower project. 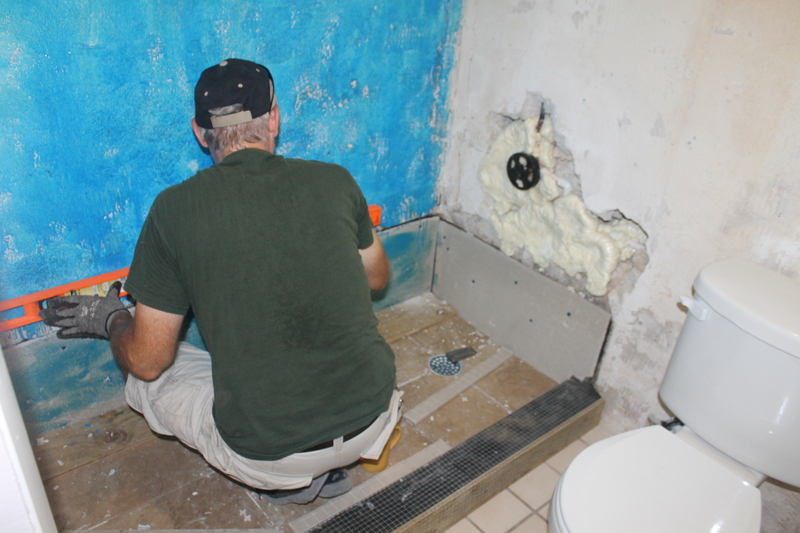 He is trying to get the shower up and functioning for Bob and Judi. 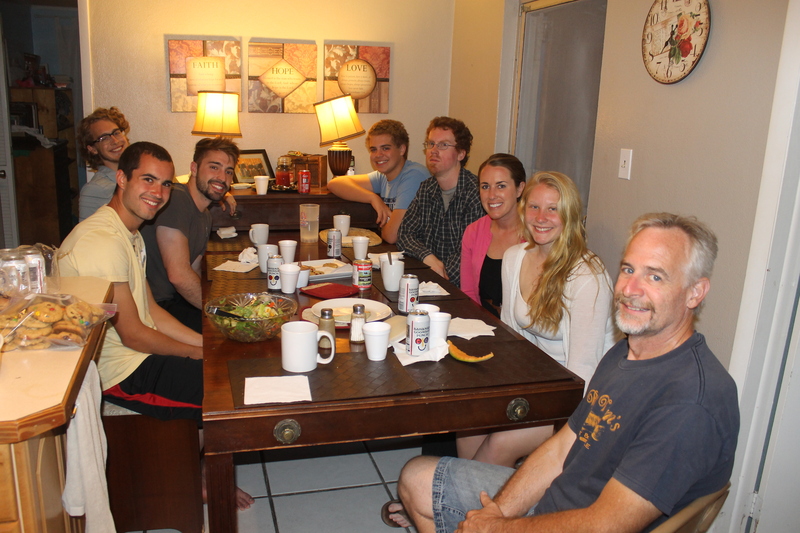 Last Saturday, Aaron Mills (we used to work with him at Living Waters Bible Camp in Wisconsin) came for a visit. He has been helping us this week. 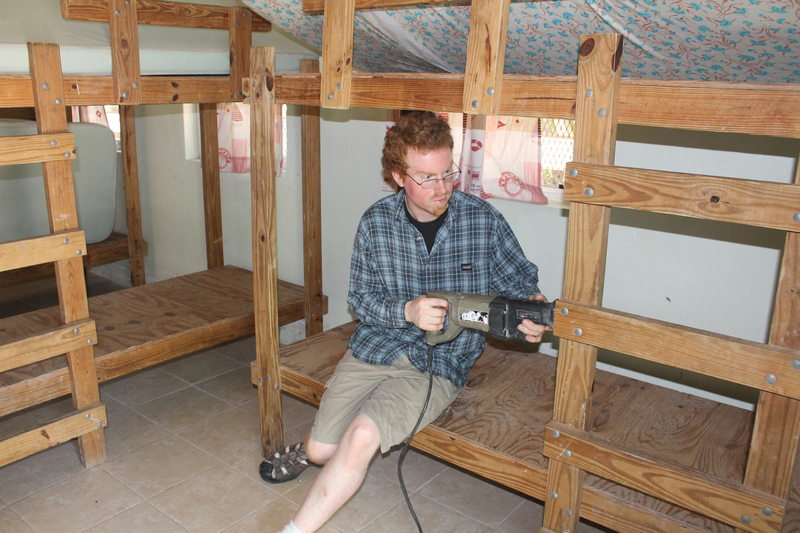 So far, he has worked on grinding bolts down on the beds so the new mattresses that we should soon be getting won’t be ripped up, installed a wifi extender to the dining hall so Bob and Judi can get internet in their apartment, and fixed the washing machine in the laundry room. He is so handy and helpful. We are thankful for his companionship and all his work. 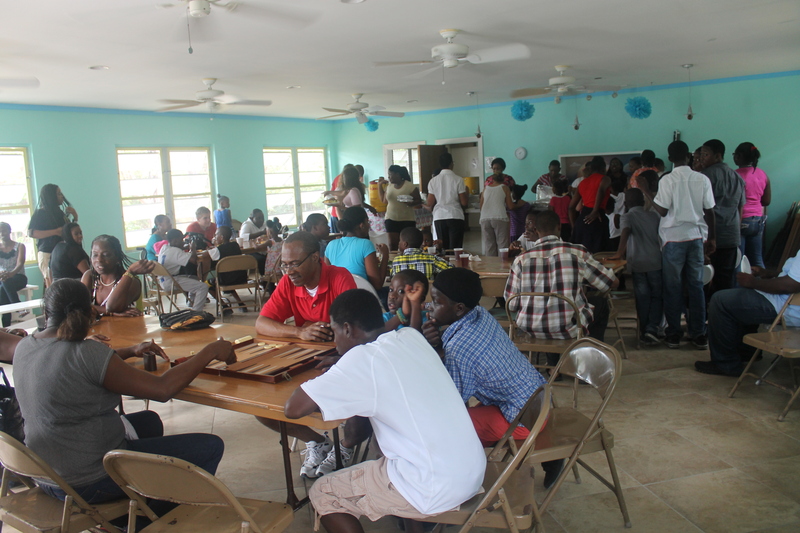 On Monday, the ALC&C had their annual fundraiser, Easter Monday Funday. 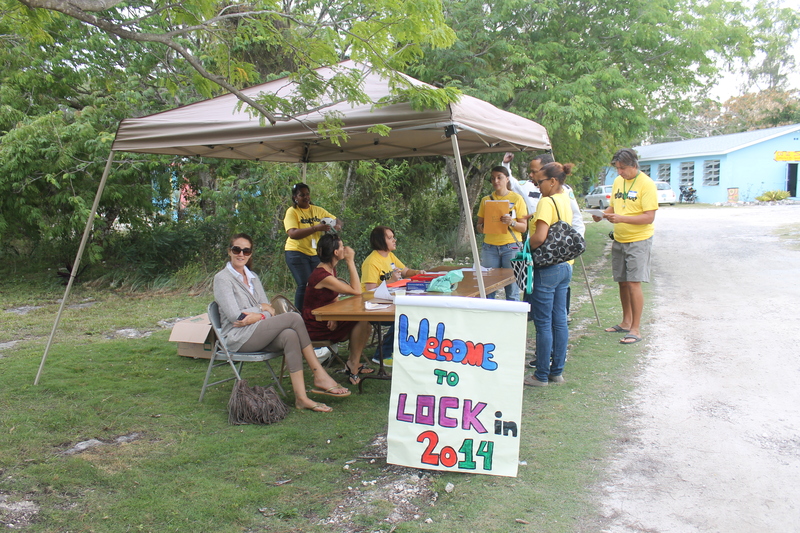 We had close to 1100 people come through the gates. It was a long, tiring day, but the weather was perfect and things seemed to work out smoothly. For your convenience, we have reposted our prayer requests from our last blog. Thank you for praying for us. Prayer is the biggest thing you can do for us. God bless! 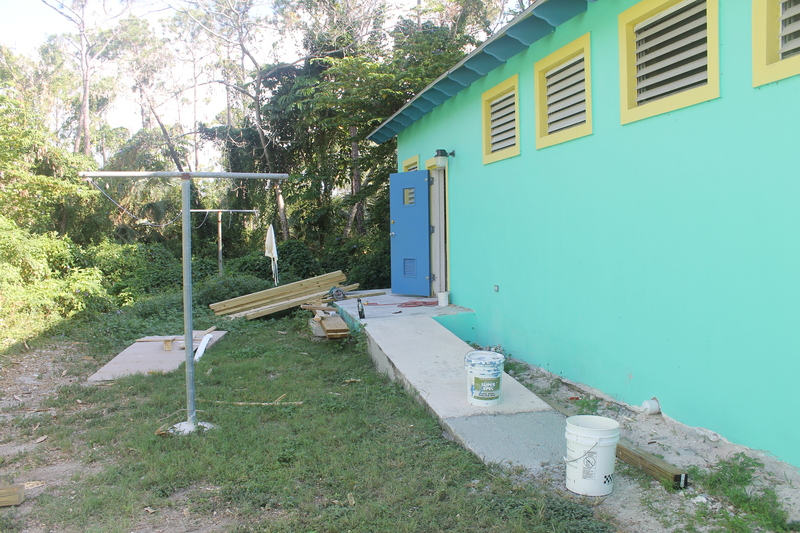 *That God continues to direct our paths and gives us wisdom and discernment as we serve the Bahamian people and those who come to serve the Bahamian people. *Zachary as he is beginning his final years of high school and all the college preparations that come with that, also as he goes to the States this summer (June 10-July 15) to visit his best friend in Tennessee and his grandparents in Indiana and aunts/uncles/cousins in South Carolina. He who calls you is faithful; he will surely do it. We feel incredibly blessed. God has handed us nothing less than His perfect best for us. 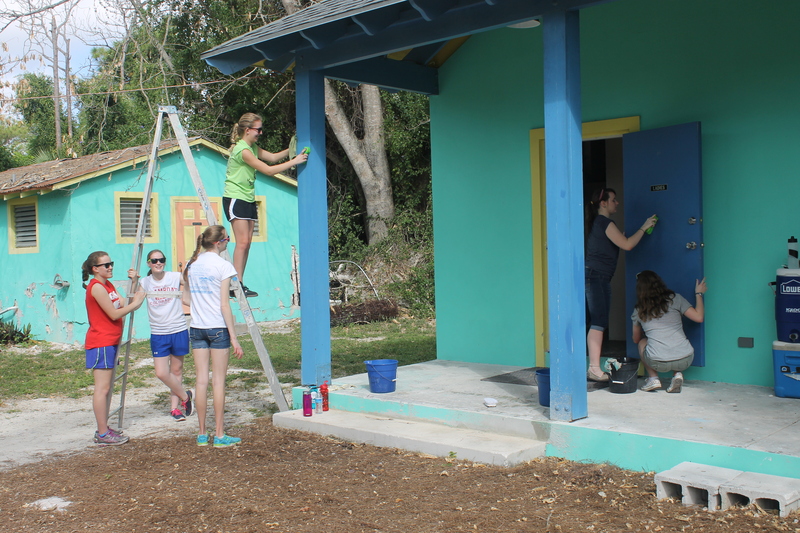 We are convinced and reminded all the time that it is God who has brought us to this tiny little island to serve the Bahamian people and those who come to the island to serve them. However, in the ministry work we do, along with joy and contentment, we sometimes experience pain and doubt. In times of stress, fatigue and discouragement, Satan temps us to dwell on the would of/could of/should of’s in life or to count the cost of what we sacrificed and gave up to come here. He also attempts to convince us to take to heart the insensitive and misinformed comments of others. Of course our faith in God and the knowledge of His character and promises cause us to lean not on our own understanding (Proverbs 3:5-6) and to seek Him for wisdom (James 1:5). Dwelling on the true nature of God, His blessings and how He has guided and directed our lives has given us great encouragement during the trials and complexities of missionary life. Recently, I (Mindy) experienced 2 moments of potential despair. While doing our income taxes in February, I assessed our financial picture for the last year and the year to come. The lower than ever adjusted gross income on the tax form along with our dwindling savings account balance led me to consider questioning God as to what He is doing. However, by the grace of God, I recognized these thoughts as Satan’s attempt to defeat and side track me. Our contentment, security, and identity are not in a bank account, consistent income, presence of possessions, etc. They come from a dependence and trust in a loving God who has promised to direct our paths and provide all our needs according to His perfect will as we faithfully serve Him (Philippians 4:19). Furthermore, we have more than most people in this world and have been blessed far beyond what we deserve. 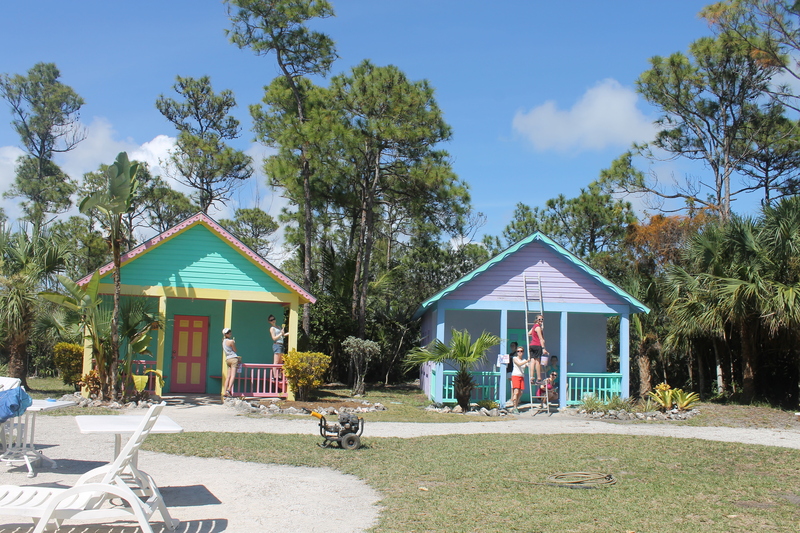 Second, family income is one sacrifice we knew we were making when we answered God’s call into full time ministry work, but we did not fully understand the sacrifices our children were going to have to make by us moving to a foreign country. As a mother, this is particularly painful for me. It is one thing to suffer consequences for our own decisions, but it is totally different seeing our sons affected by those decisions. They have had to give up relationships with friends back in the States and chances to do “normal” high school boy things such as sports teams, driver’s education (Zachary would be going through drivers education and working on getting his license right now if he were back in the States), jobs to make spending money and pay for college (Bahamas is very protective of its jobs, and the boys are not allowed to seek gainful employment here), etc. Of more consequence is the fact that Logan may be facing higher college tuition costs. As an expatriate residing in a foreign country, he technically does not qualify for in state tuition at any state university. We are praying that the University of Minnesota will look at the fact that he was born in Minnesota and lived most of his life there and neighboring Wisconsin before moving to The Bahamas, his brothers reside there, and he plans to return there. Praise the Lord he has a substantial academic scholarship that will help if he does not get in state tuition. Regardless, we know God will provide. It is so comforting to know that God is so much bigger than our circumstances and that He is faithful. I Thessalonians 5:24 (ESV) says, “He who calls you is faithful; he will surely do it.” God has indeed called us to this place and work. He will equip and supply us with the physical, emotional and mental resources needed to fulfill that calling. 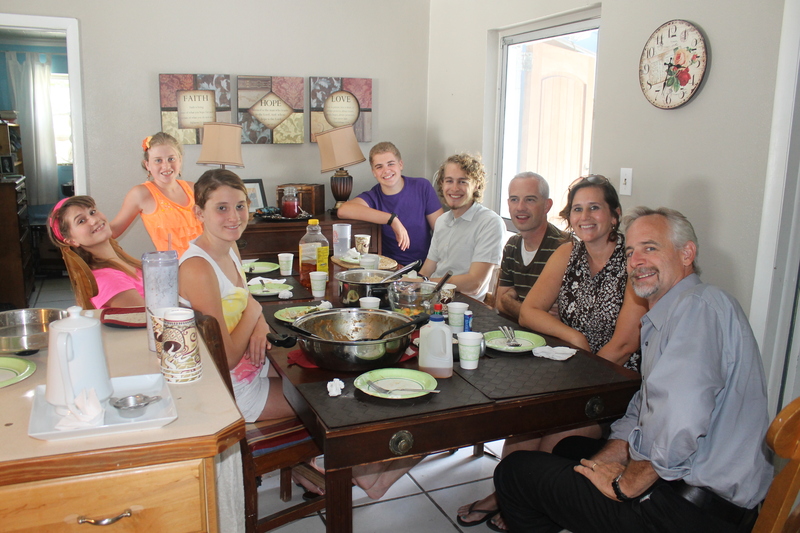 Please pray that God continues to direct our paths, that the U of M looks favorably on Logan’s situation and allows him to qualify for in state tuition, and that (if He thinks it is in our best interest) God raises up more monthly supporters to help close our monthly income-expense gap. 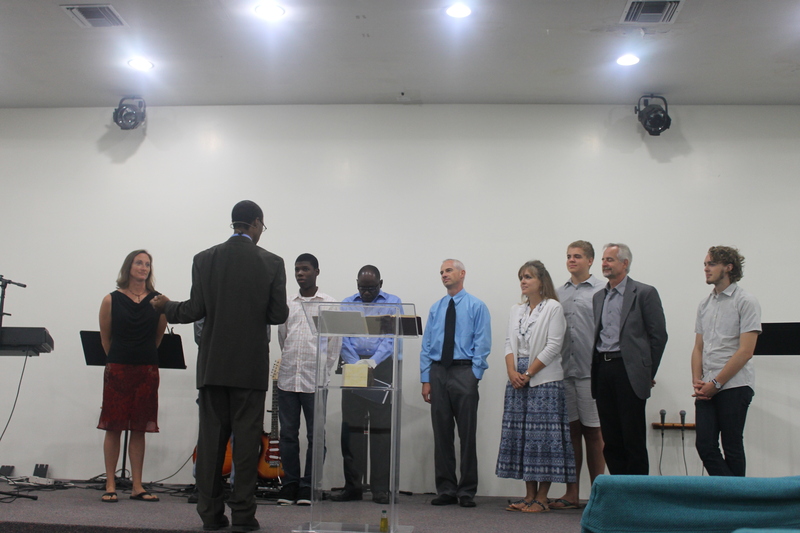 On March 16th, we were welcomed into membership and are now under the guidance and shepherding of the elders of Kingdom Life Church. There is no place we would rather be right now. 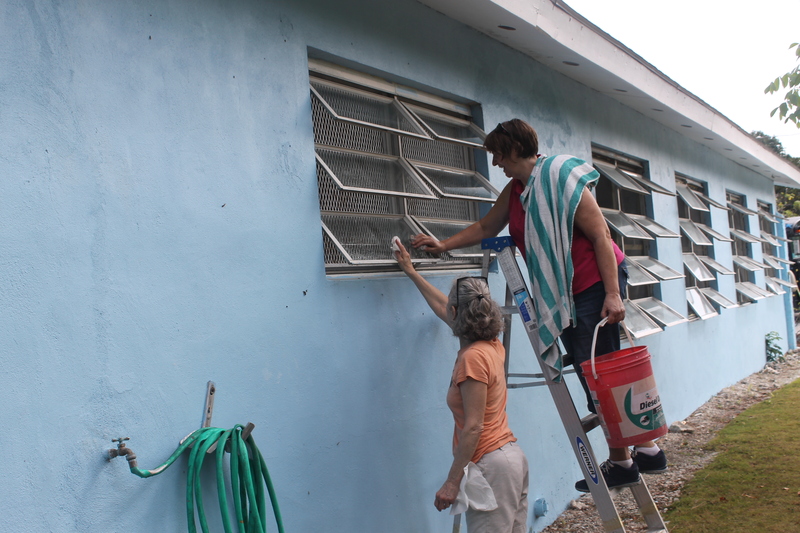 The care we have received there has been exactly what we have needed. They are a true family to us, and we feel blessed and honored to be a part of KLC. 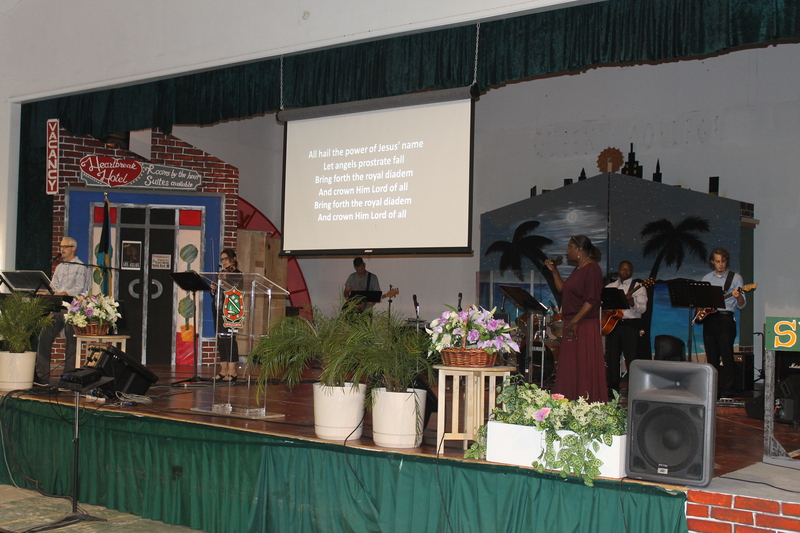 Once again, we have experienced encouragement and blessing from our church through the song services. We would like to share yet another song we sing regularly. It is called My Redeemer’s Love. His love truly is higher than the mountain peaks and He is all we need! Within the next week or so, we will be sending out a brief blog update spelling out details of Logan’s transition back to the USA. Have you liked us on Facebook yet? We have a family ministry site on Facebook. 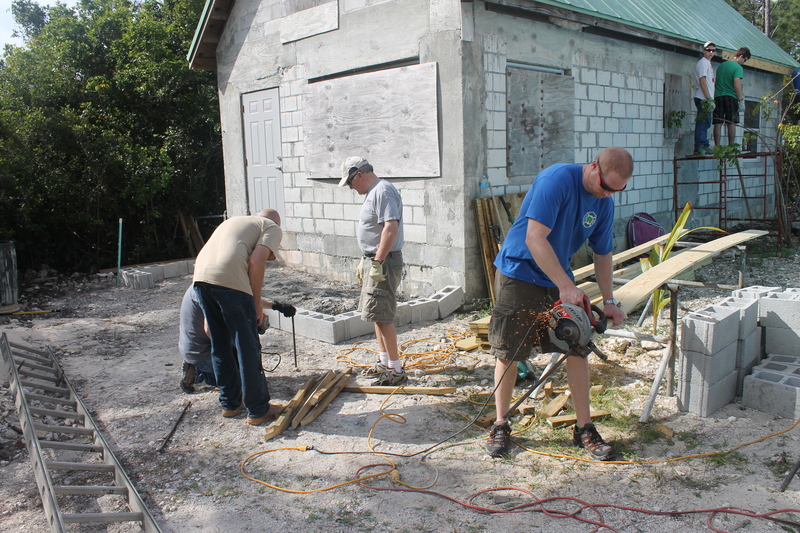 You can access it by searching “The Seeley Family Serving in The Bahamas”. We post timely, frequent updates on the site. 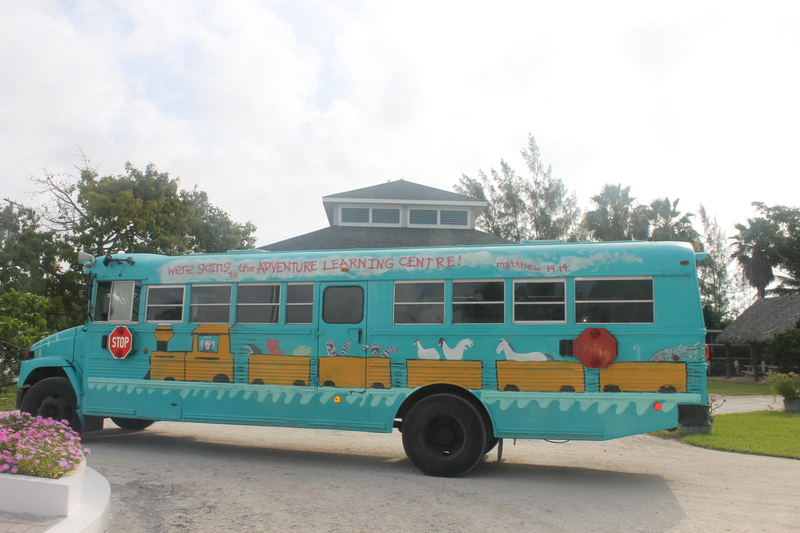 Have you considered “Following” us on our blog? This is a quick and easy way to access our blog posts. You may follow us by clicking on the “Follow Blog via Email” on this page. Don’t forget to check your email after you submit. You will need to verify you want to follow our blog through that email. 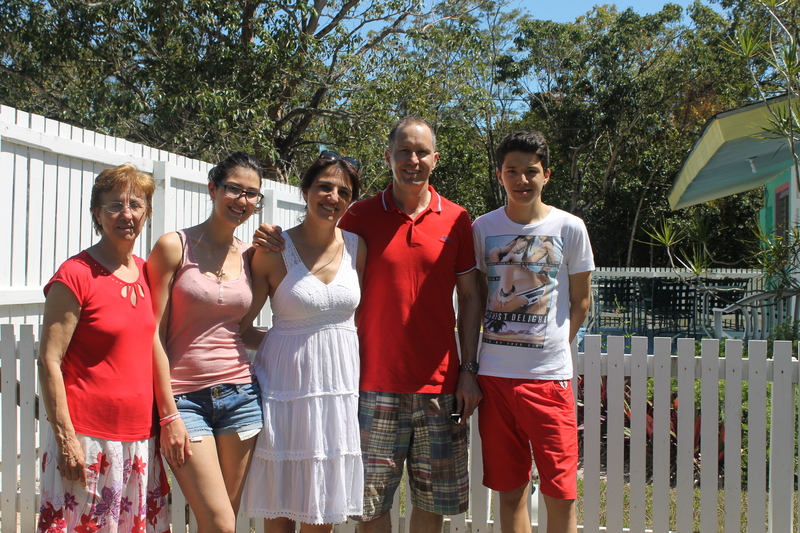 Getting all we can of this family before they leave to go back to the States in June. 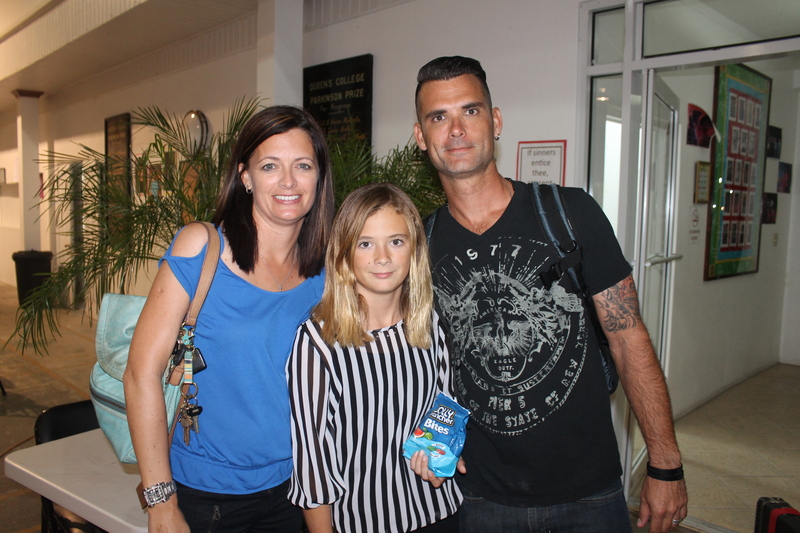 This is Keith and Kristin Bunting and their daughters Keaton, Kara, and Kendall. Happy 19th Birthday, Kevin! 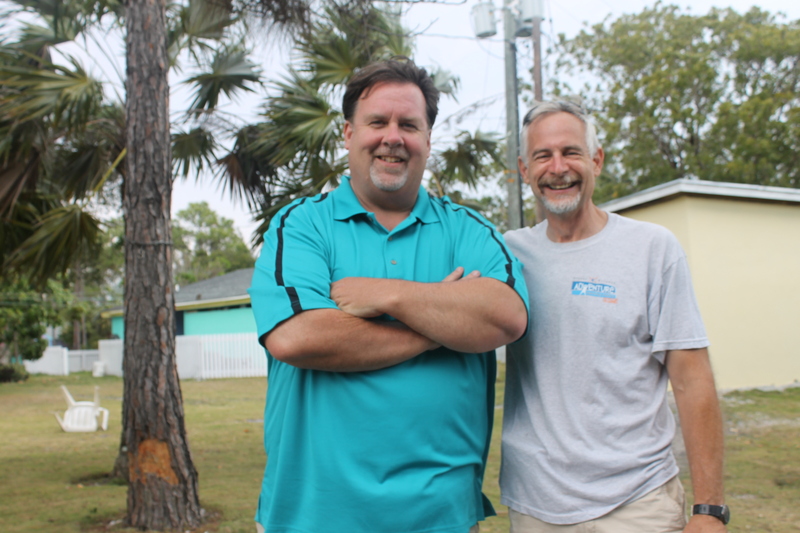 Kevin is the foster son of our maintenance guy, Tom Schafer. 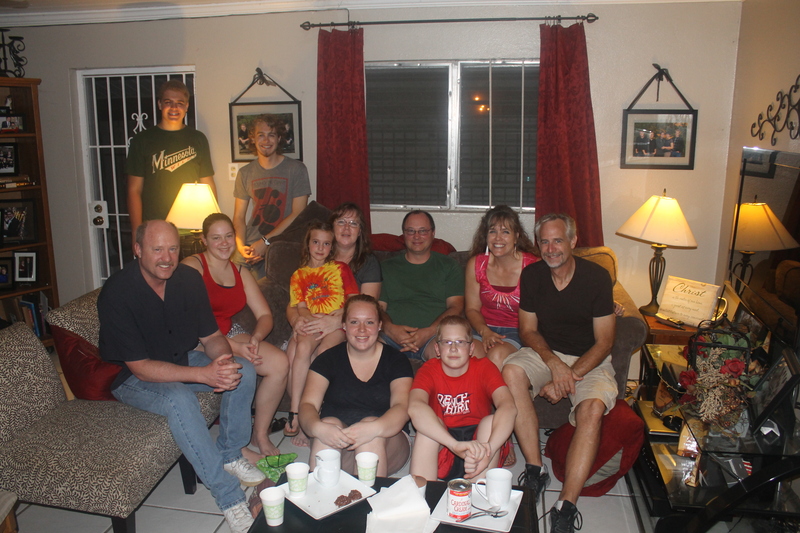 Tim’s cousins Dave and Jon Stassel and Jon’s family were with us for dinner on Monday, March 17th. 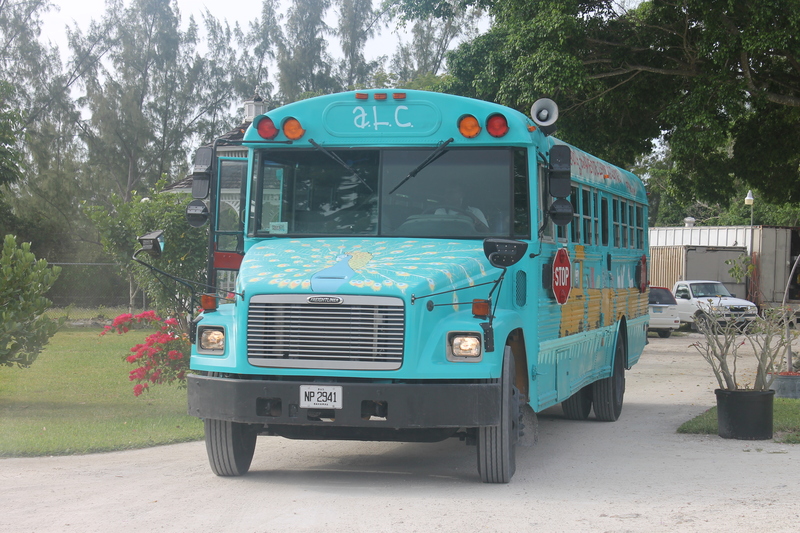 Jon helped build the ALC in the early to mid 1990’s. 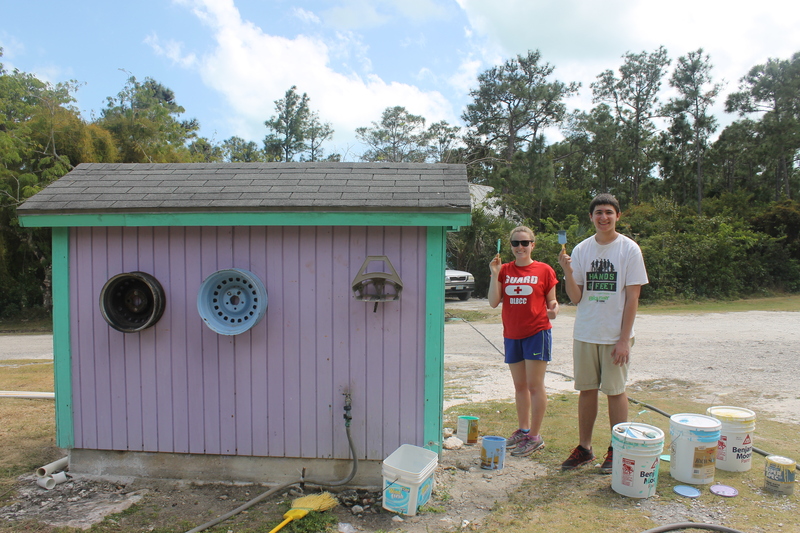 They were on the island for a week to help Billy and Leah Slater at their church and home. After dinner, we took the Stassels on a tour of the Centre. We got a lot of neat information from Jon about this place in the early days. Tim with David Stassel on the left and Jon Stassel on the right. 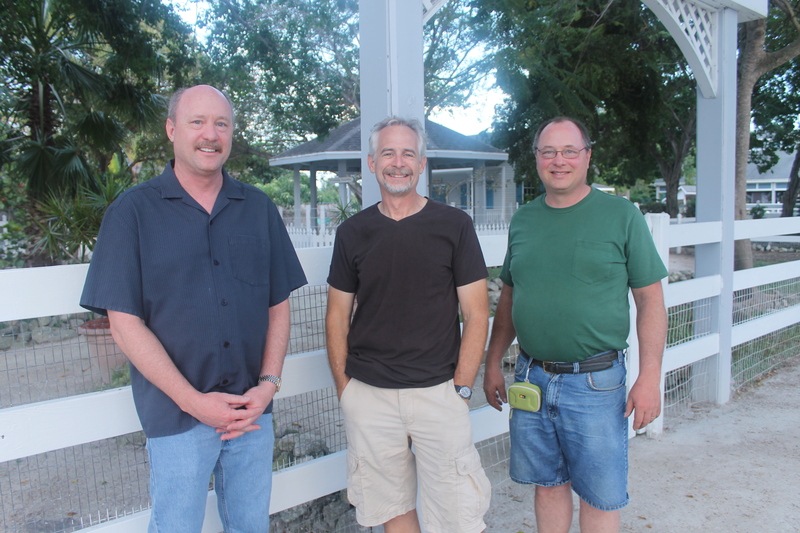 Jon is the camp director of Mountain View Bible Camp in Pennsylvania, and David is a airline pilot. More of the babies…the Centre has welcomed many baby sheep and goats. Some more pictures of these baby animals can be seen on ALC&C Facebook site and our family Facebook site. 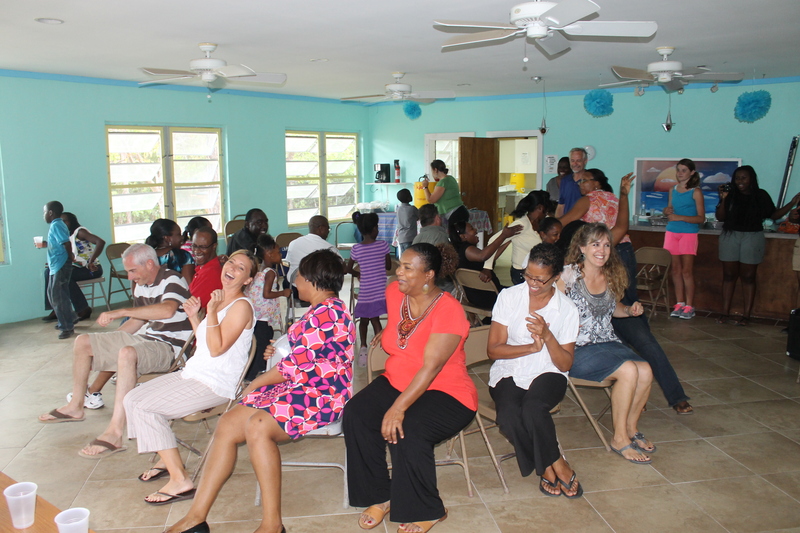 Facilitators/staff having fun before Marion left to go back to France. 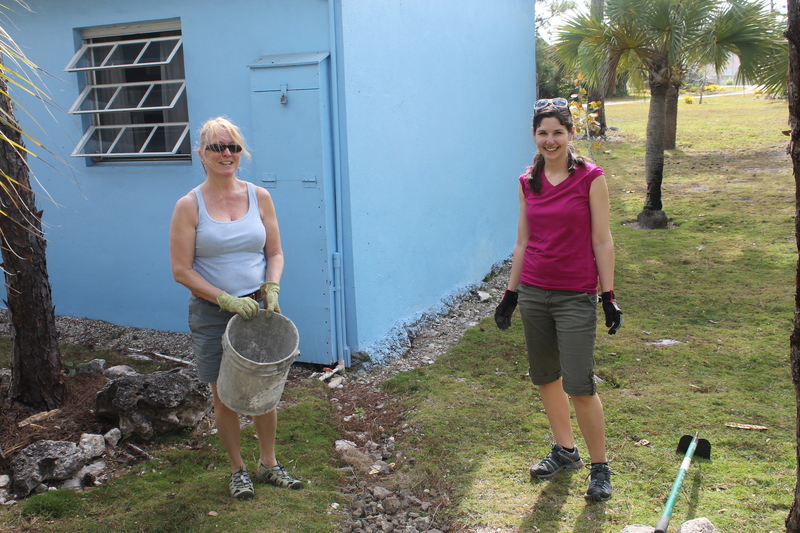 You may recall that Marion Brodeau was a volunteer facilitator who came here in the fall to work for nearly 2 months. 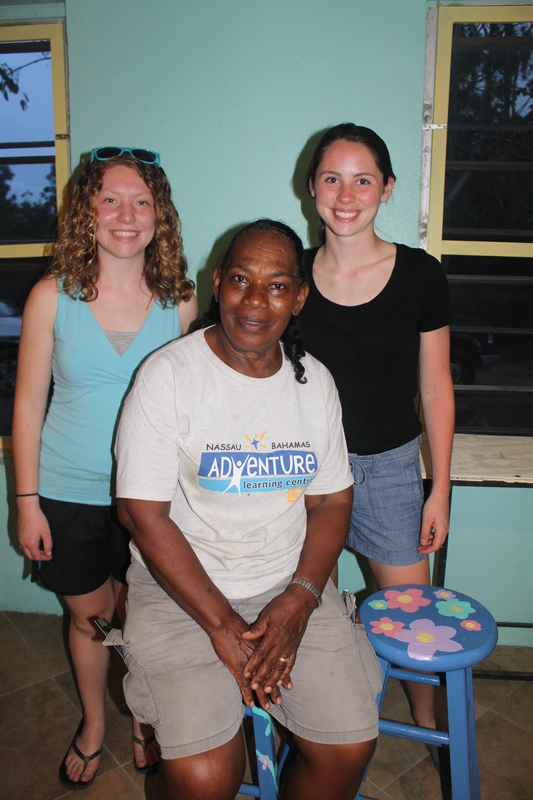 She left us in November to go to Haiti for a short trip. She stopped back here on her way back to France. 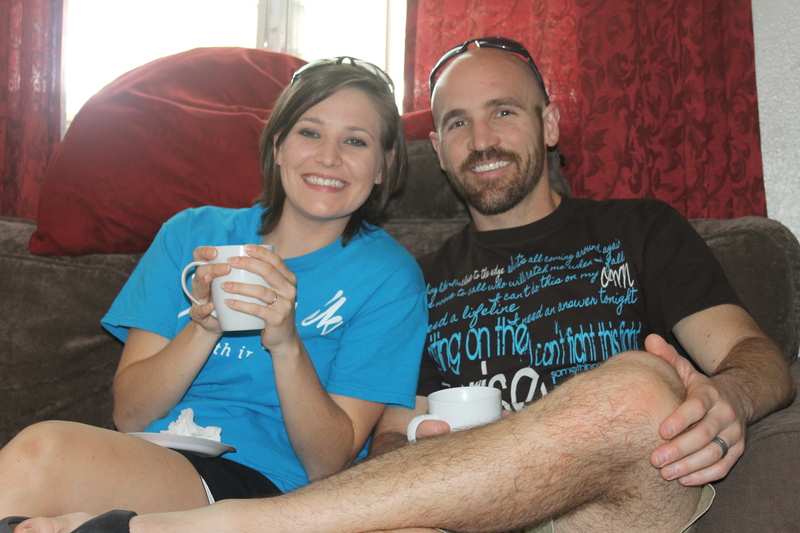 She helped out a bit and rested up after her several months of missionary service. 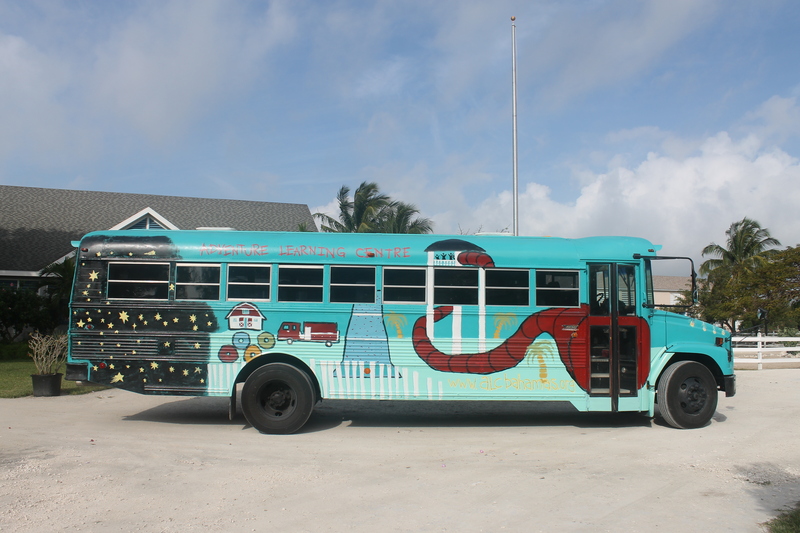 In our last post, we showed the unfinished paint job of our new ALC bus. Here is the finished product. 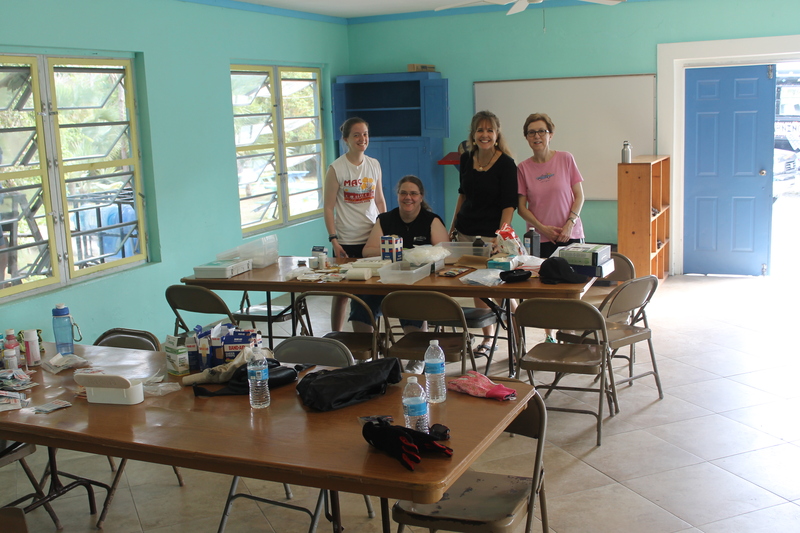 Thank you again, Judson University for all your hard work! Bob Browning and Tom Schafer finishing up the welding job on the new train trolley. One of the finishing touches to the inside of the girl staff cottage is the making and hanging of the curtains. 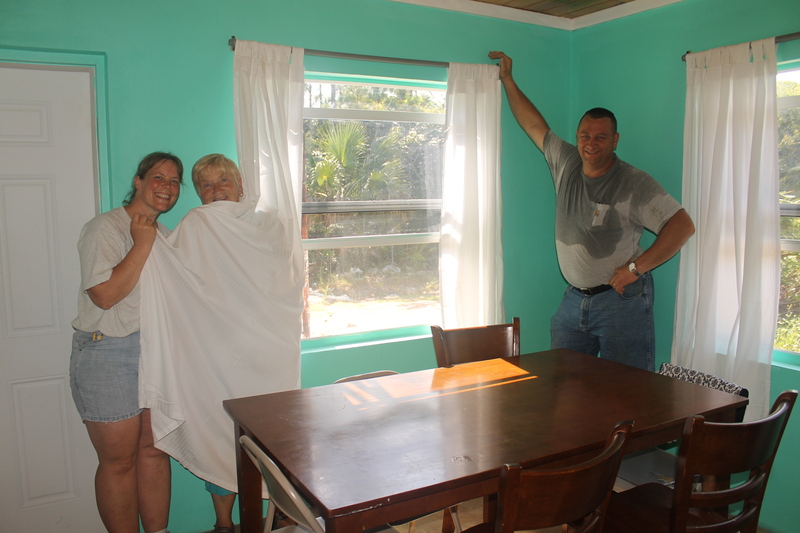 Faye Browning used donated white sheets from Atlantis to make the curtains, and Bob and Judi helped construct and hang the hardware. 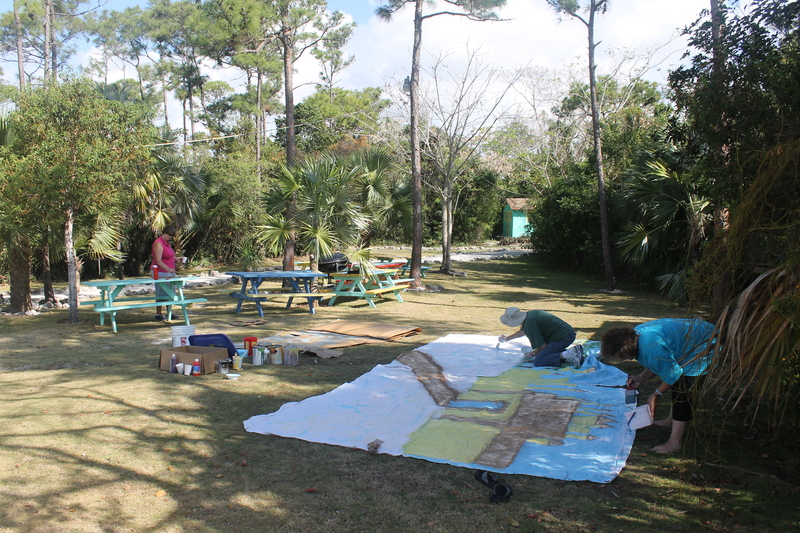 One of the jobs that has been needing done since before we arrived last year is the repair and painting of the signs around camp. 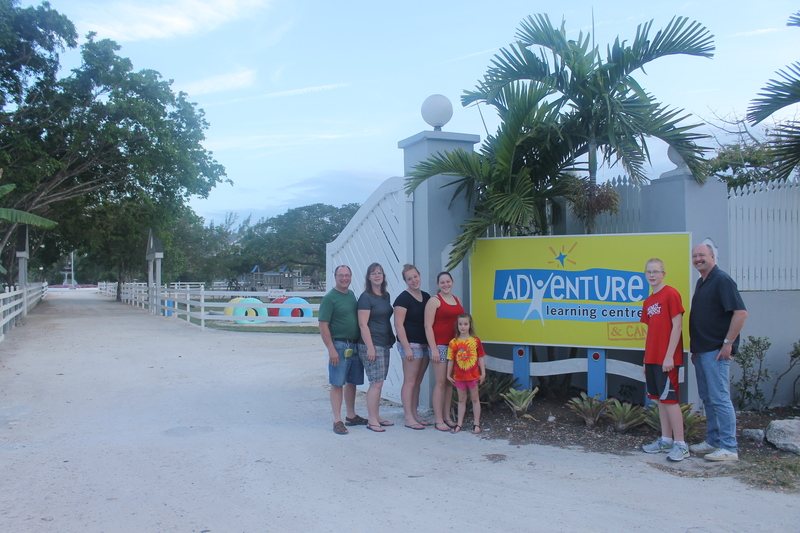 With Bob and Judi here, this sign job and other maintenance jobs are finally getting done. 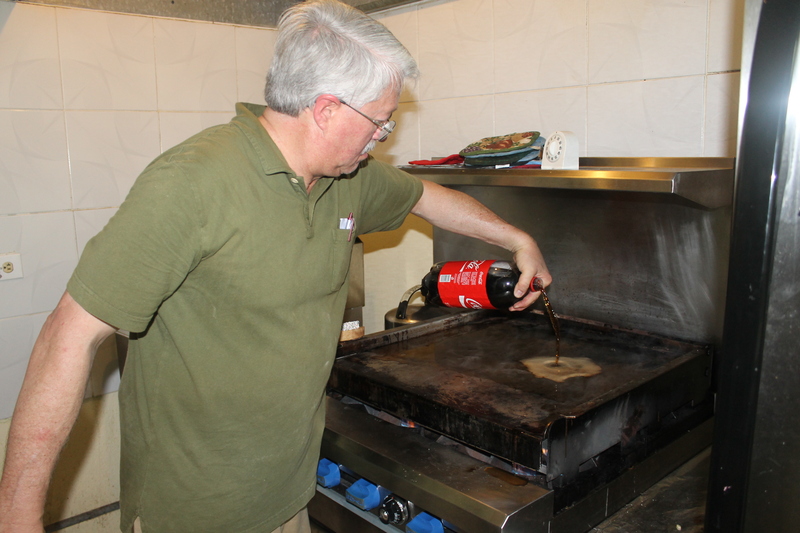 We are so thankful for Bob and Judi being here to help Tom (our maintenance guy) with these smaller jobs while Tom focuses on the bigger jobs. 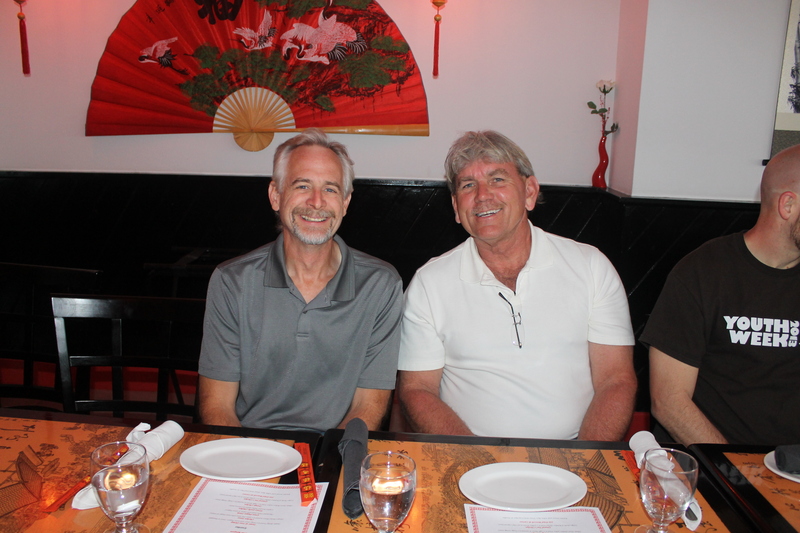 Also, since Tim is not having to do these various jobs, Tim is freed up to focus more on getting the office work, marketing, relationship-building and organizational planning jobs done. 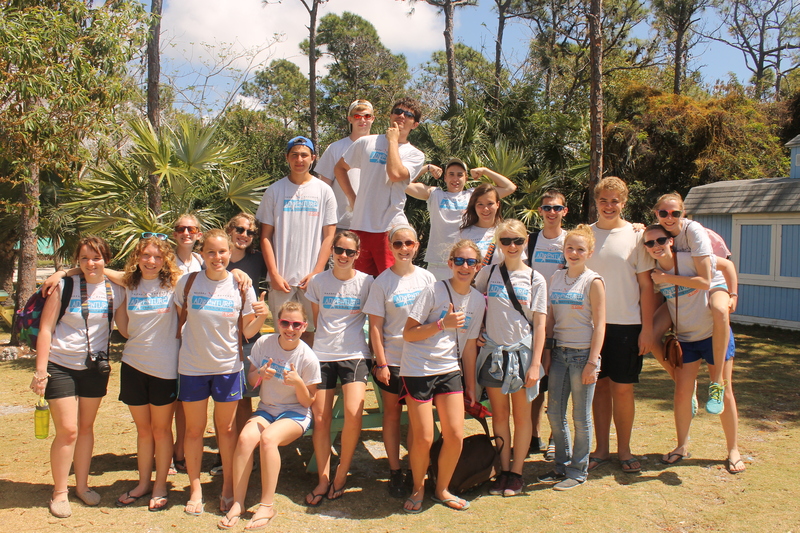 We welcomed the Six78 youth group from Calvary Chapel-Plantation, Florida to ALCamp on March 21st-26th. 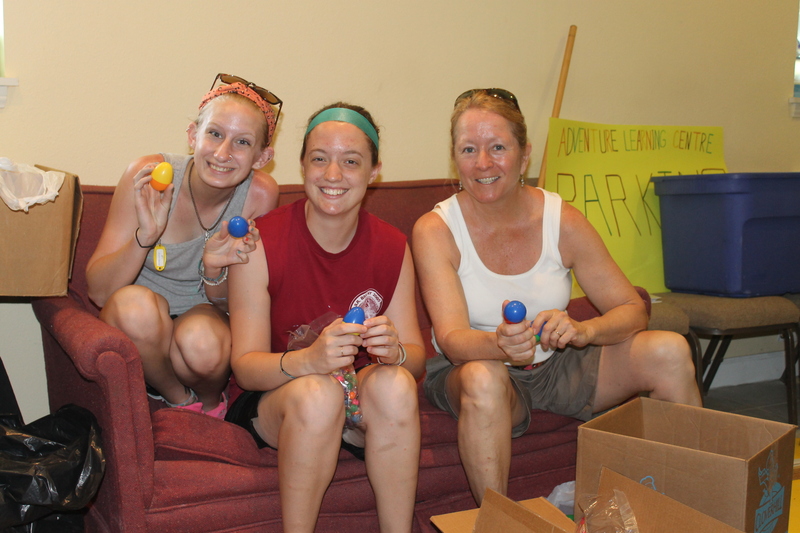 They were here on a mission trip. 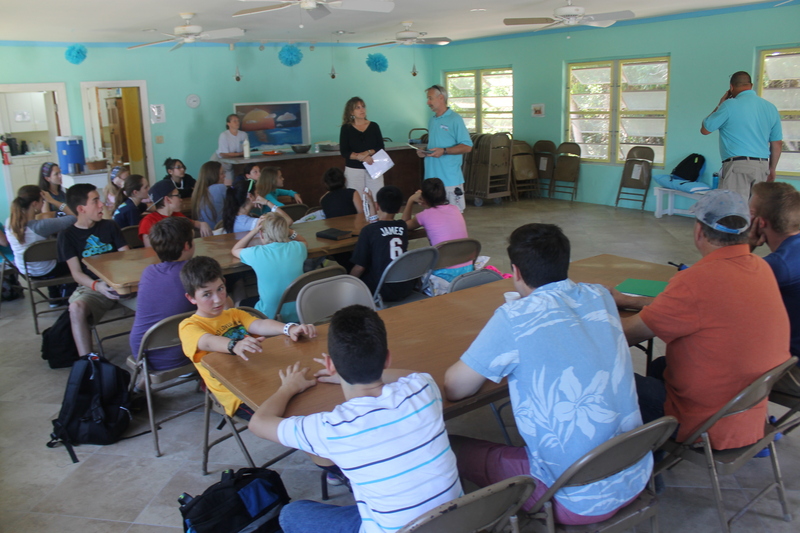 Also on March 21st, we welcomed to the island Pastor Lyall Mix and his wife Julie. 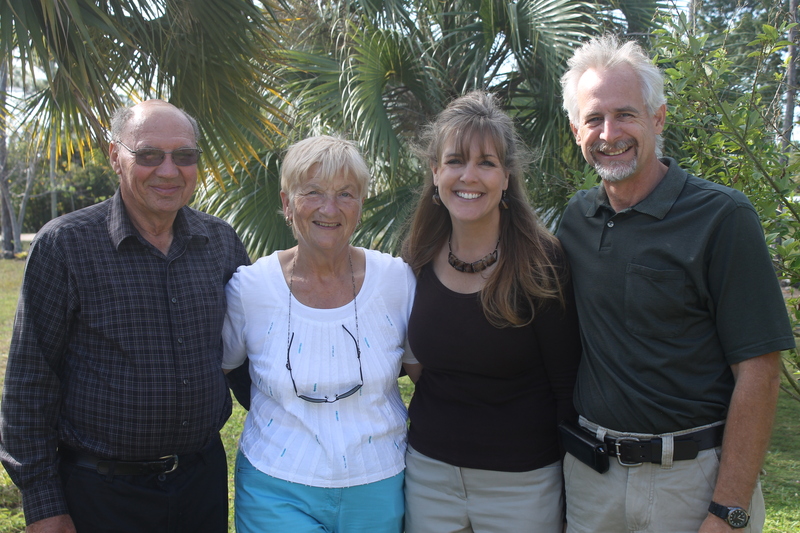 Lyall is Bob and Faye Browning’s pastor from London, Ontario, Canada. 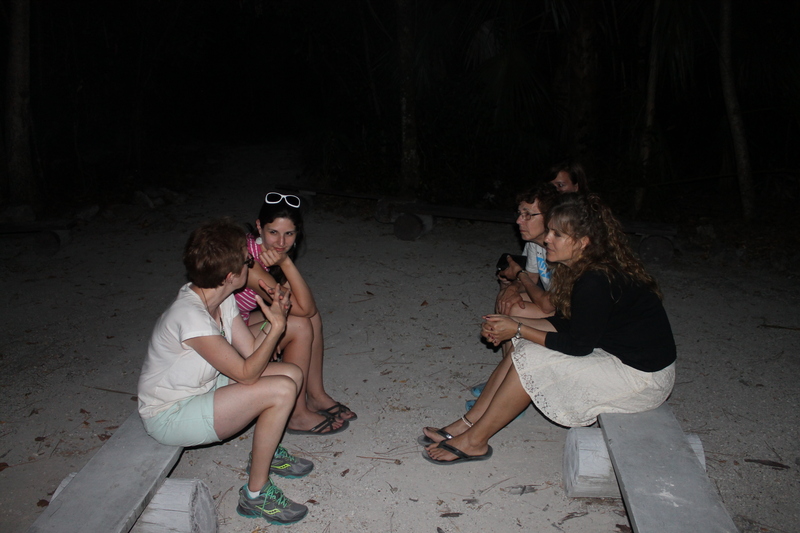 They were on the island to investigate a possible mission trip site for their church. 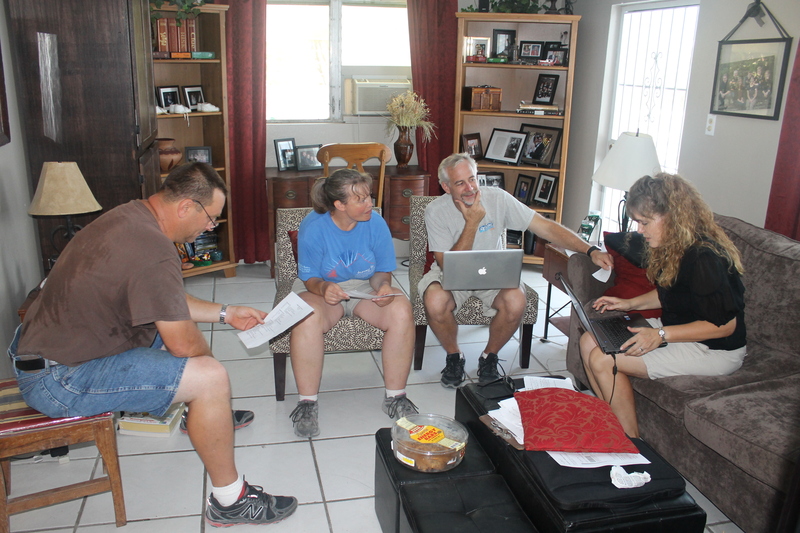 …Tim sat with Lyall and Julie to discuss mission team particulars. 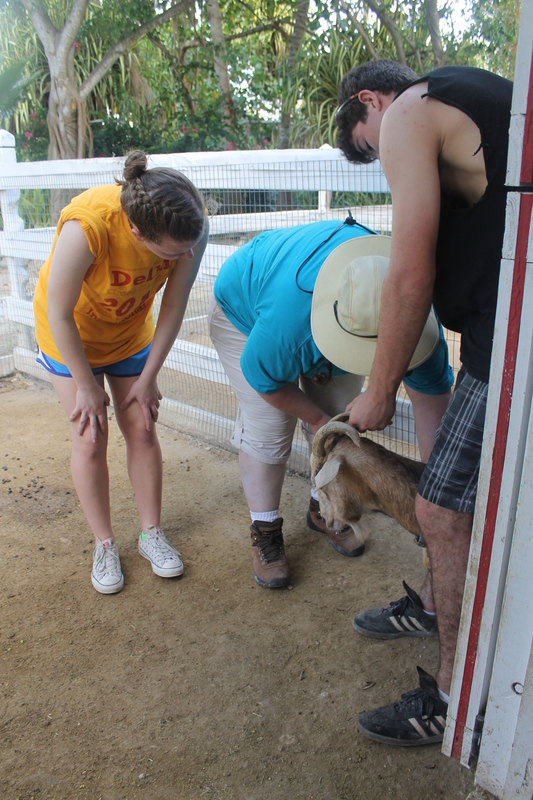 Dave (one of the leaders of the Six78 mission team) fed Rue our donkey. More hosting of Lyall and Julie. 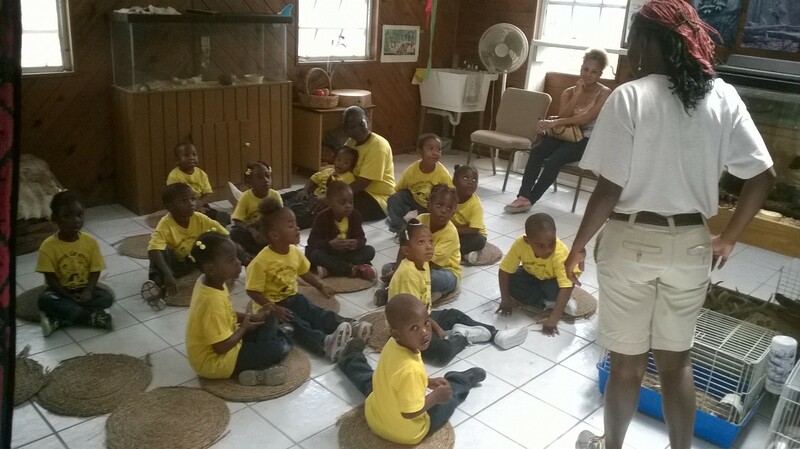 We were able to share dinner and then took them to Paradise Island to see Marina Village, the Dig and Junkanoo. 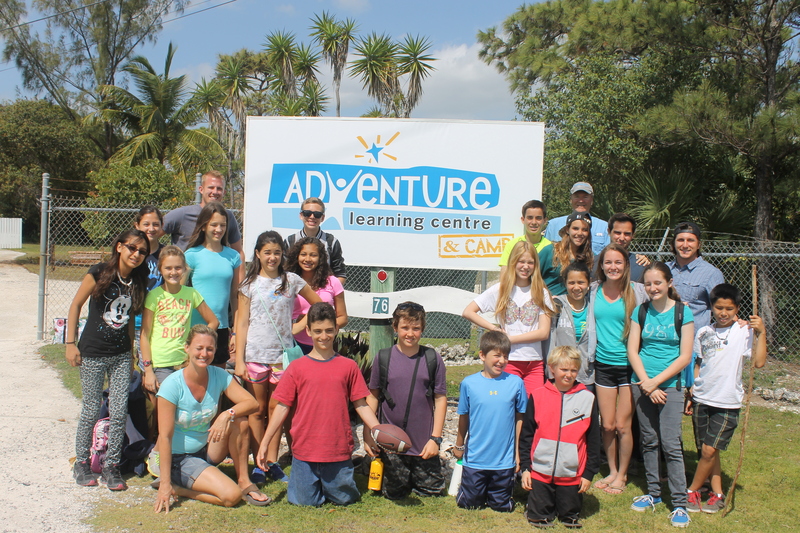 Can you believe I missed getting a group picture of one of our mission teams? I am slacking that is for sure. I am forced to put up individual pictures. 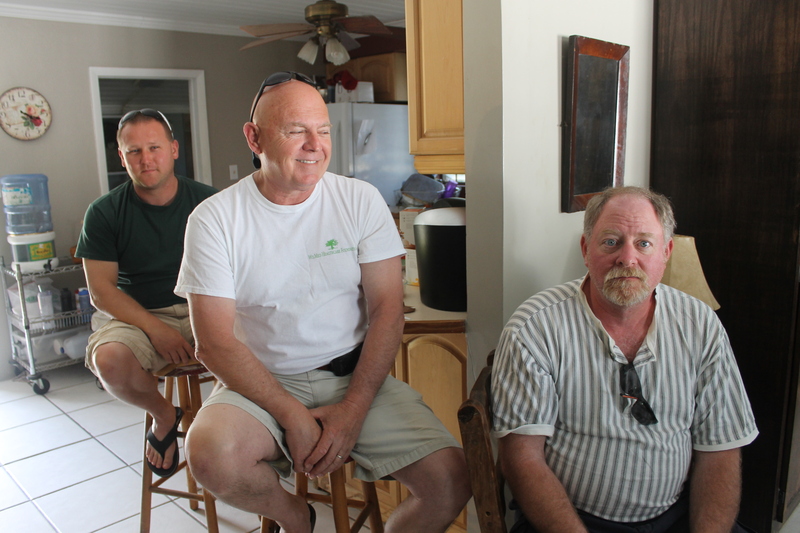 The team is from Peace Church in Wilson, NC and is led by Tim Lamm (standing). 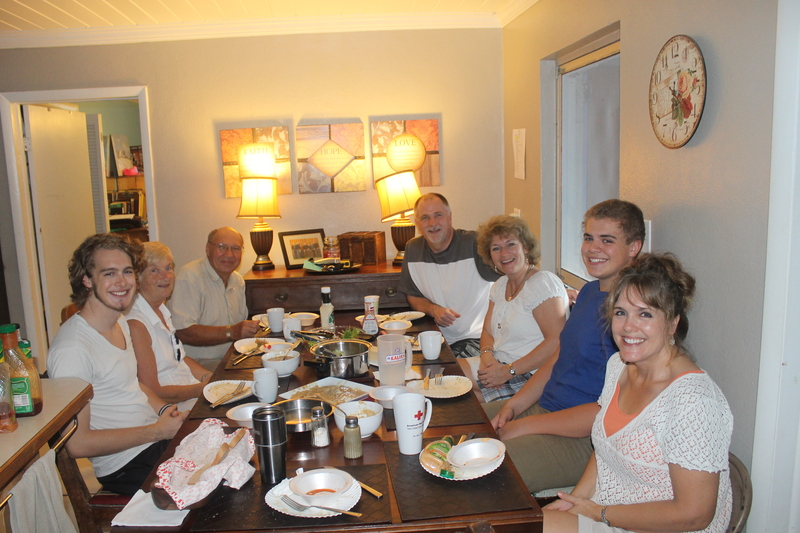 Peace Church blessed the missionary staff by taking them out to dinner at a Chinese Restaurant while they were here. 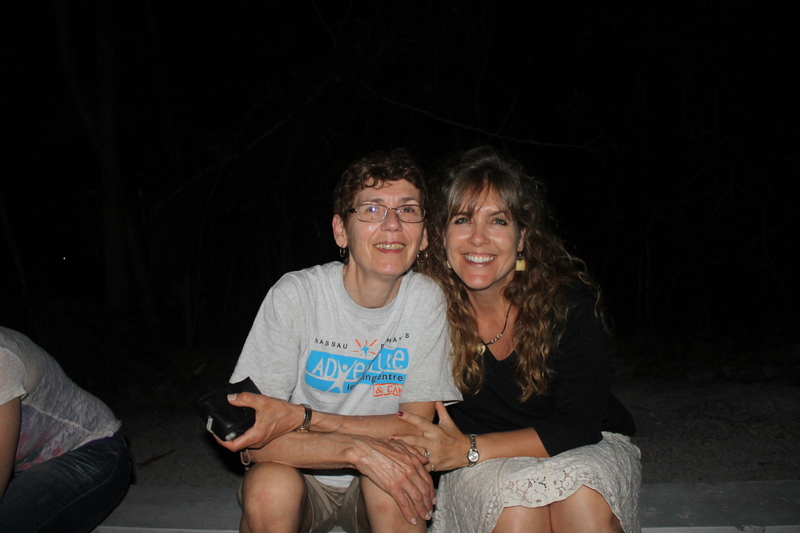 My dear friend, Deborah Lamm. This woman is such a blessing. Deborah’s husband is also a Tim. 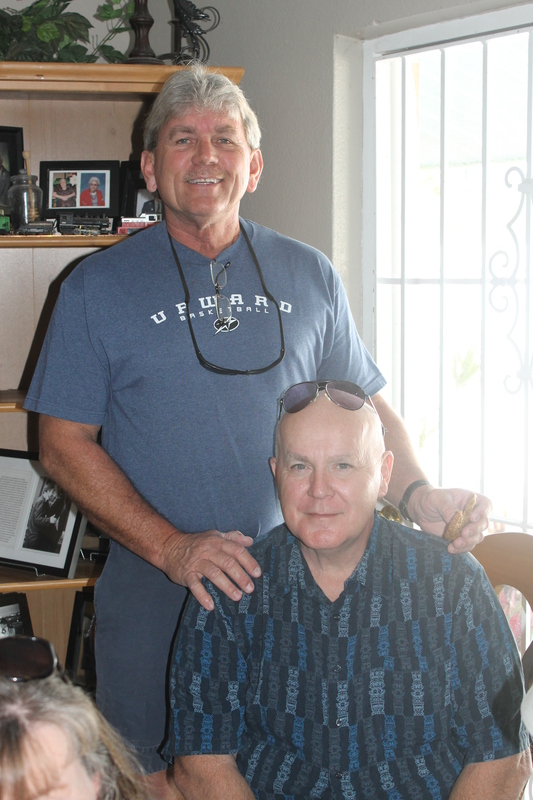 Our husbands, Tim and Tim. 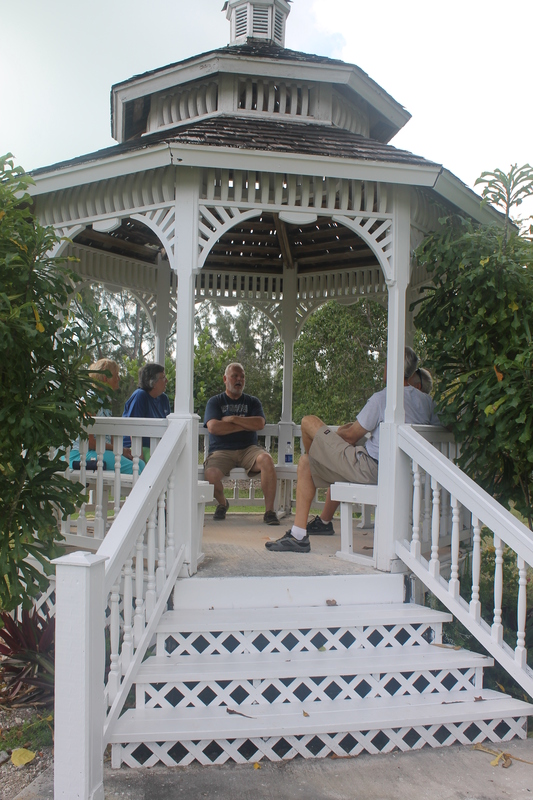 One of the couples from the Peace Church mission team is contemplating coming down to volunteer at the ALC&C for multiple 6 week to 2 month time periods. We had a meeting with them one morning they were here. One of the benefits of homeschooling and necessities if you want to get something done without the distractions or temptation of camp life/work: school at Starbucks. 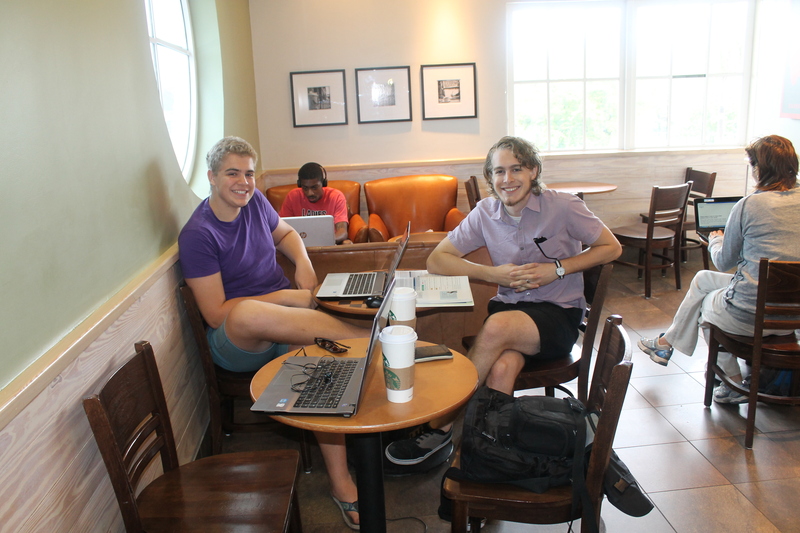 There is a Starbucks on the north side of the island that has unlimited free wifi. We take our school work and go do school there on Tuesdays. Good-bye again! 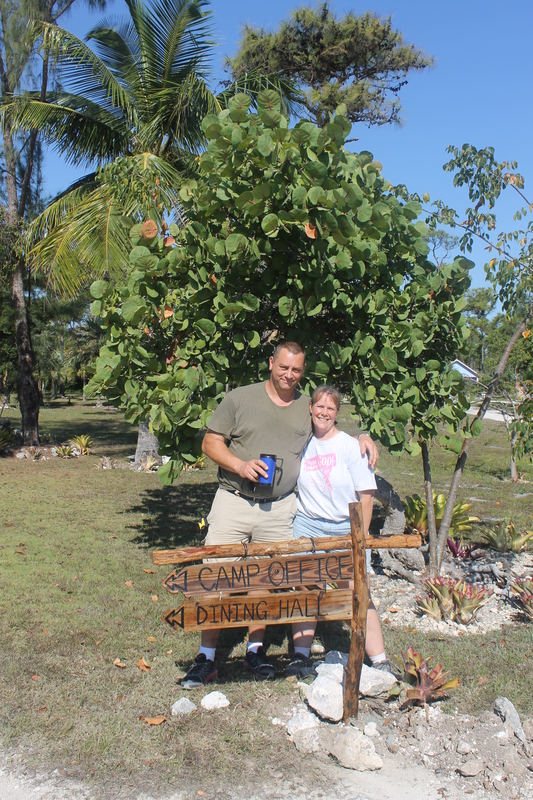 Bob and Faye Browning left the island on March 26th. It was a sad day for us. They are such big helps to the ministry work here. Good-bye, Bob and Faye. We are going to miss you. 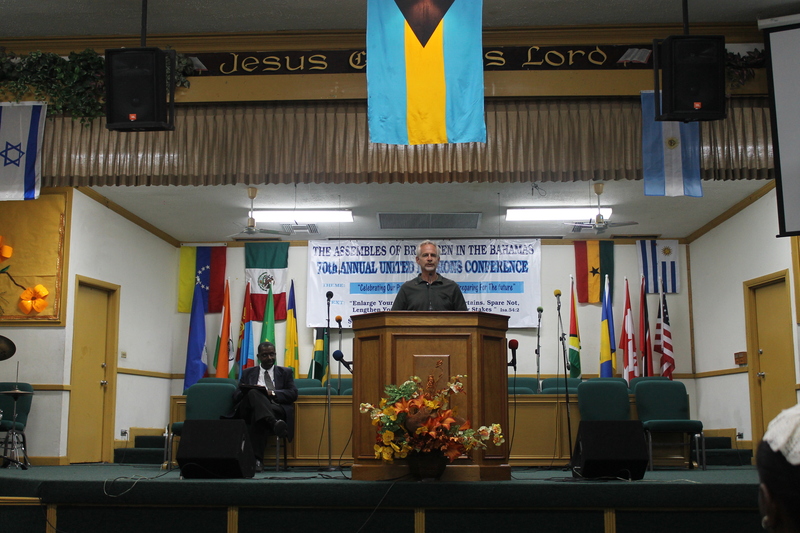 One of the Six78 mission team members was Wesley. He reminds me a lot of my son Garrett when he was that age. 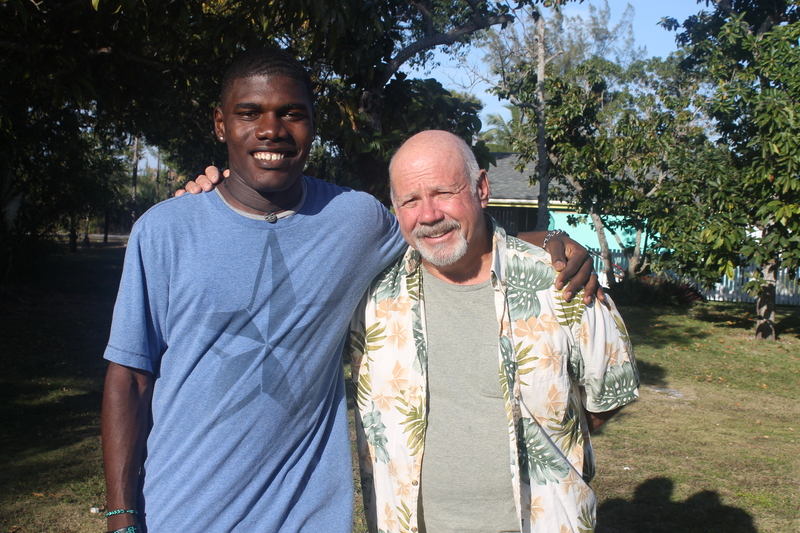 I enjoyed getting to know this young man. 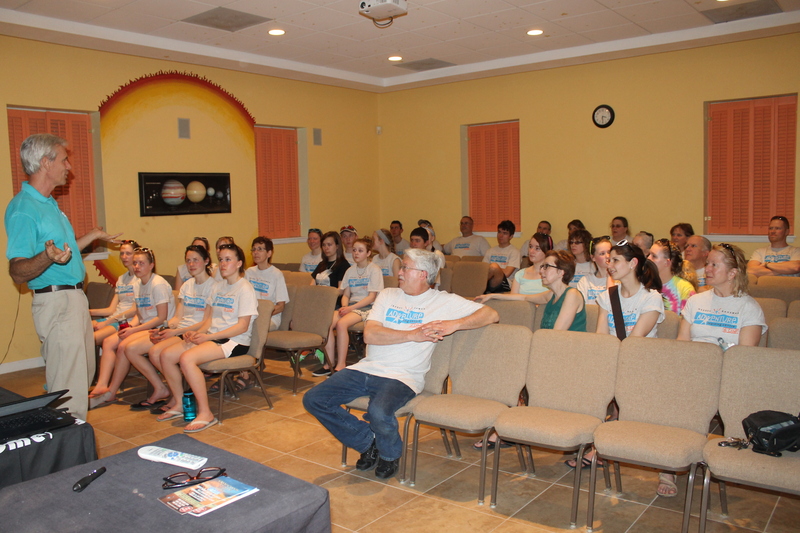 Six78 youth just before leaving to go to the airport to fly back to Florida. 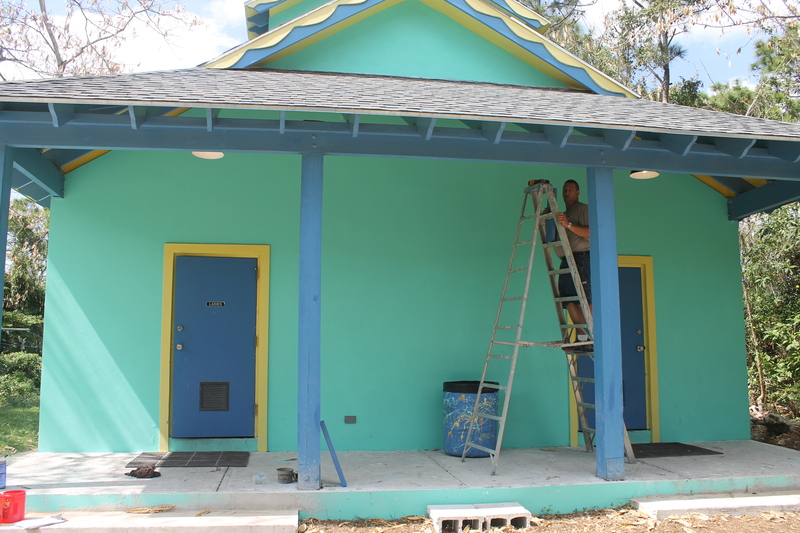 Bob worked on adding light fixtures to the bath house porch. We now have a lighted porch. We had a prayer meeting while this was going on. 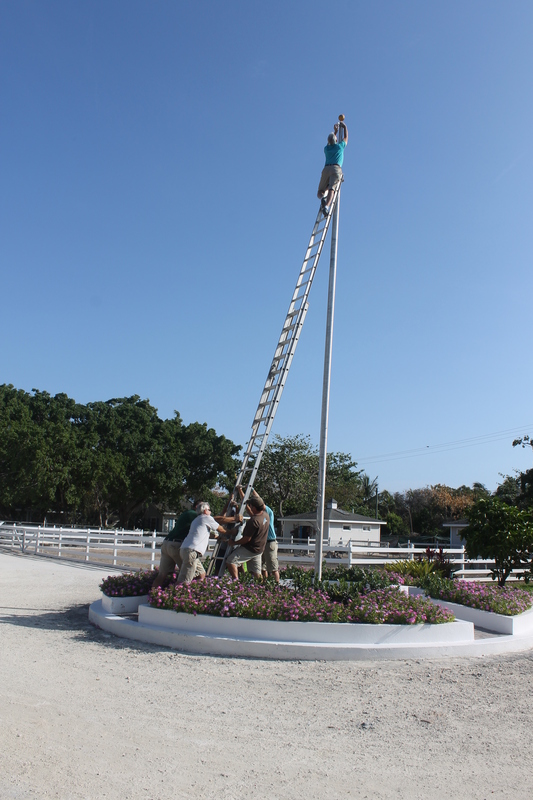 The flag had not flown for a while because the pulley at the top was jammed by the roap. 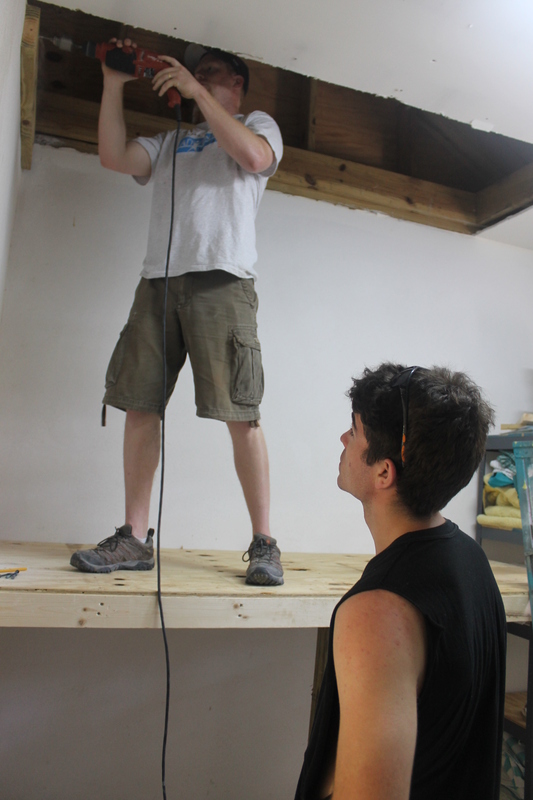 Mark climbed a ladder to fix it while the rest of us prayed he would not fall. 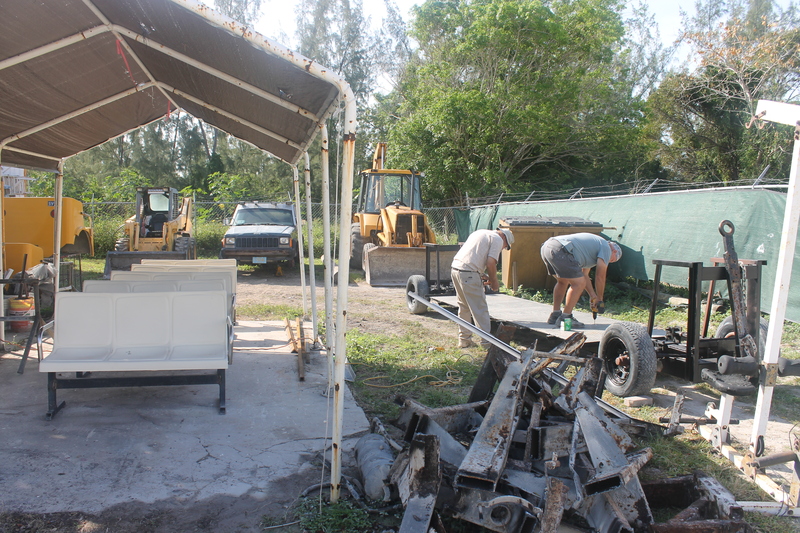 Thanks to the hard work of Tom Schafer, Bob Browning and Bob’s friend Andy, the trolley that broke at the 20th anniversary celebration is now replaced. 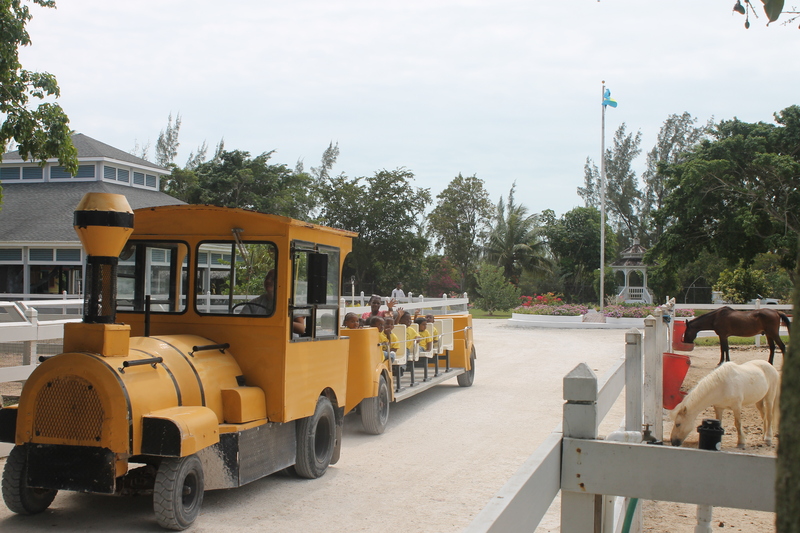 The Bahamian children now get to enjoy the rebuilt train trolley. 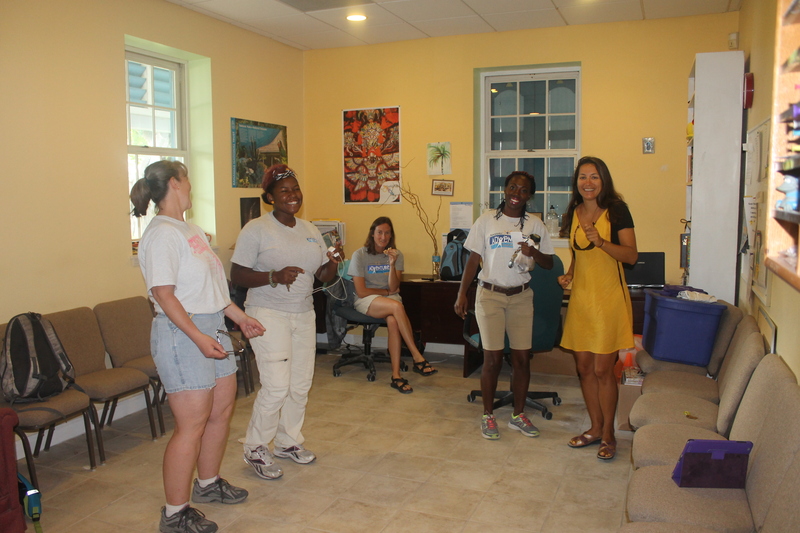 Sam facilitating a group in the Nature Centre. 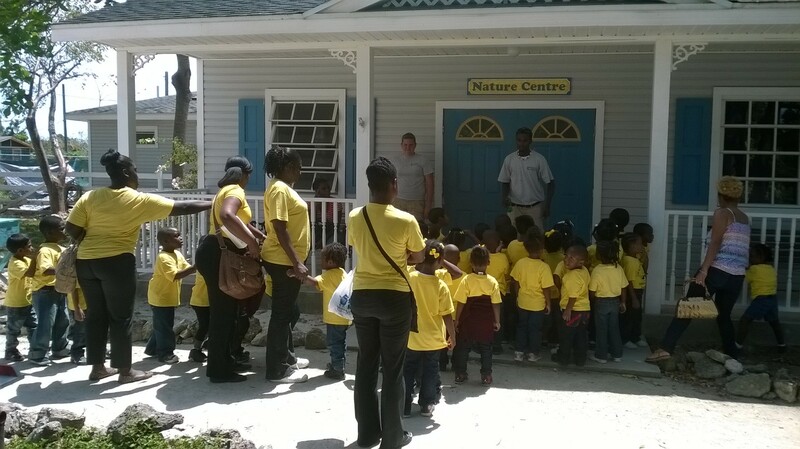 Elton Deetjen facilitating a group that is about ready to enter the Nature Centre. Peace Church left at 530am on Friday, but having to get up early did not give us an excuse to get to go to bed early that night. 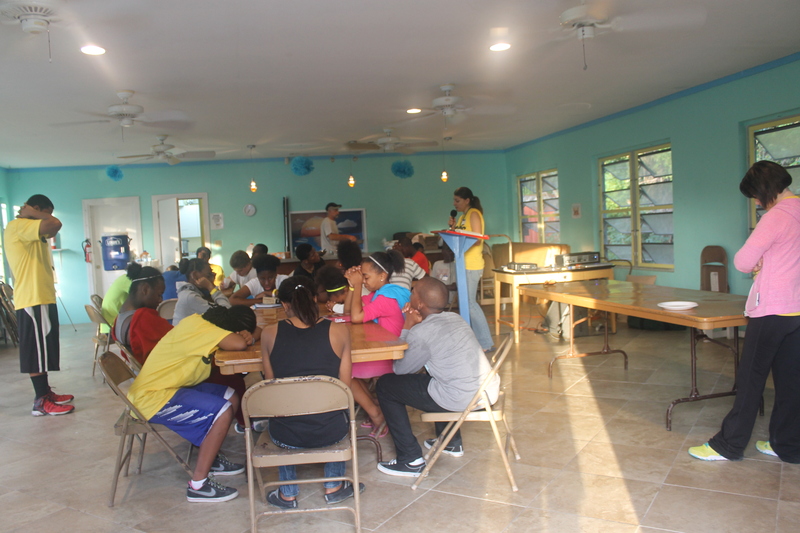 We hosted and cooked for a local church’s youth lock-in/ sleepless sleepover. 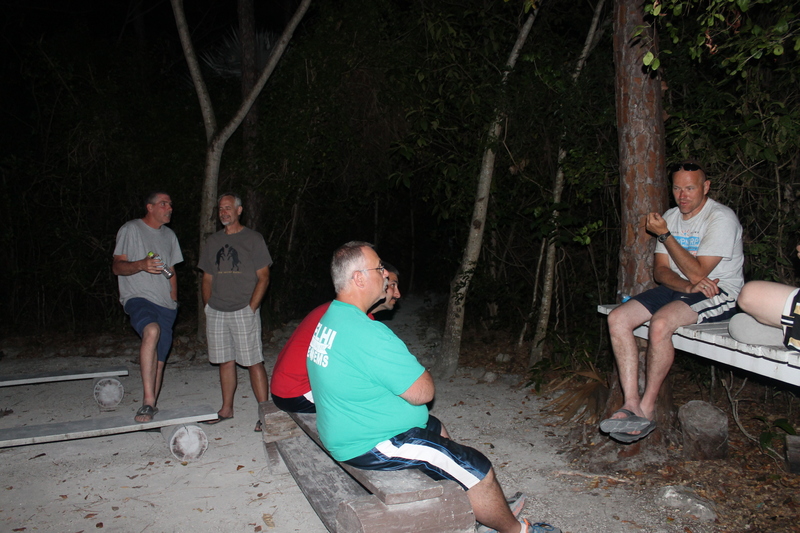 …but by morning, the were pretty tired. Thankfully we got to get some sleep. We did not stay up all night with the group. 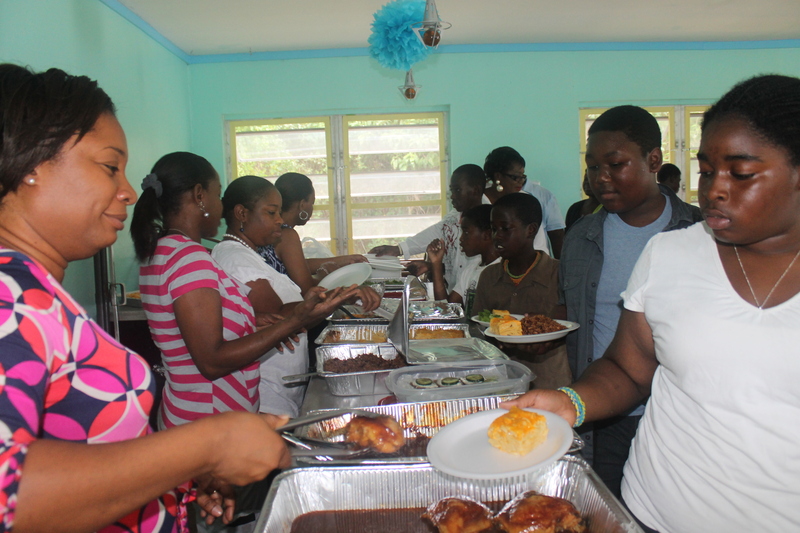 On Sunday, Kingdom Life Church held their annual church picnic at ALCamp. Their picnic at camp last year was the first time we met this group and was instrumental in encouraging us to check Kingdom Life Church out. …fun. 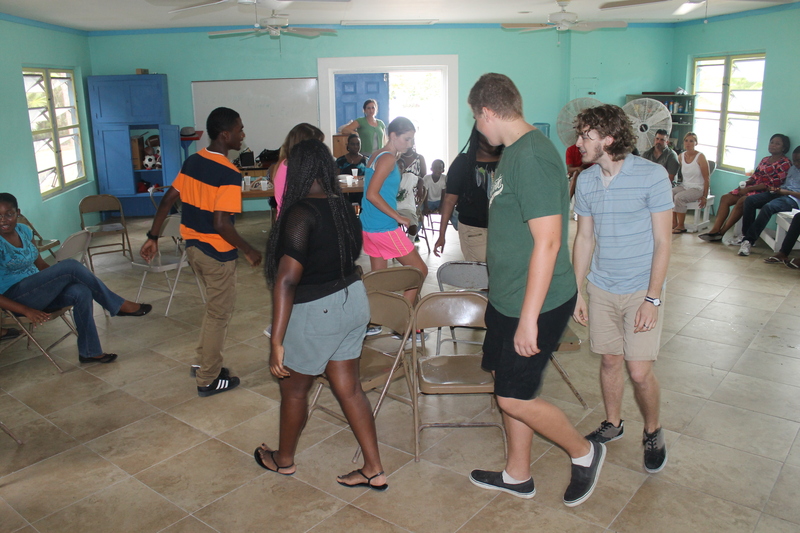 The highlight was the different age levels of musical chairs. Watching adults play musical chairs is very entertaining. This week we said another good-bye. This time to Michelle Brisbin. She came to us in November. We hated to see her go. 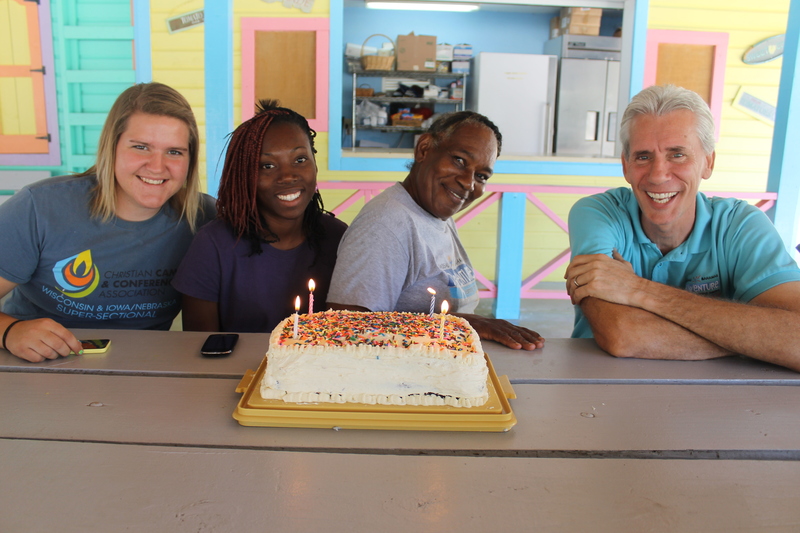 We celebrated Sam’s birthday (March 26), Ms. Ada’s birthday (April 6) and Mark’s birthday (May 6). We also used the time to commemorate Michelle’s going away. 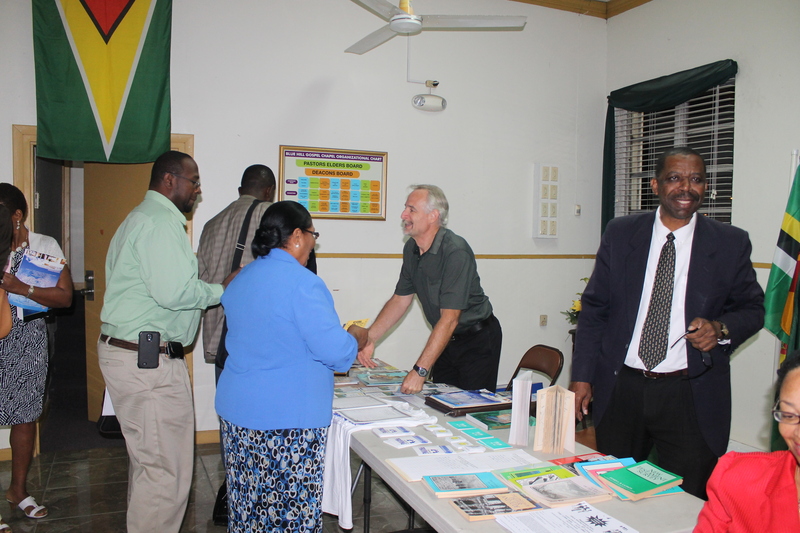 Tim got to share a short ALC &C update at the united brethren church’s annual missions conference on Tuesday evening. We saw a lot of people we knew at the conference. 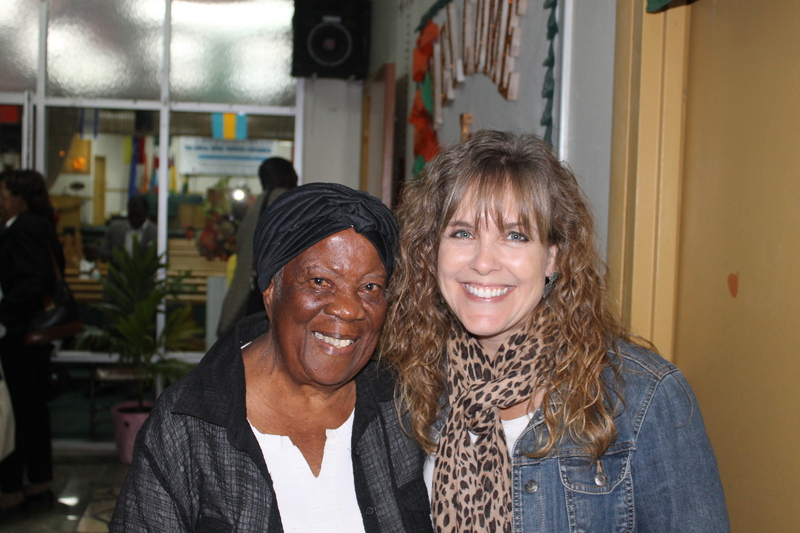 Included among them was this dear 91 year old lade, Ms. Dorsett. 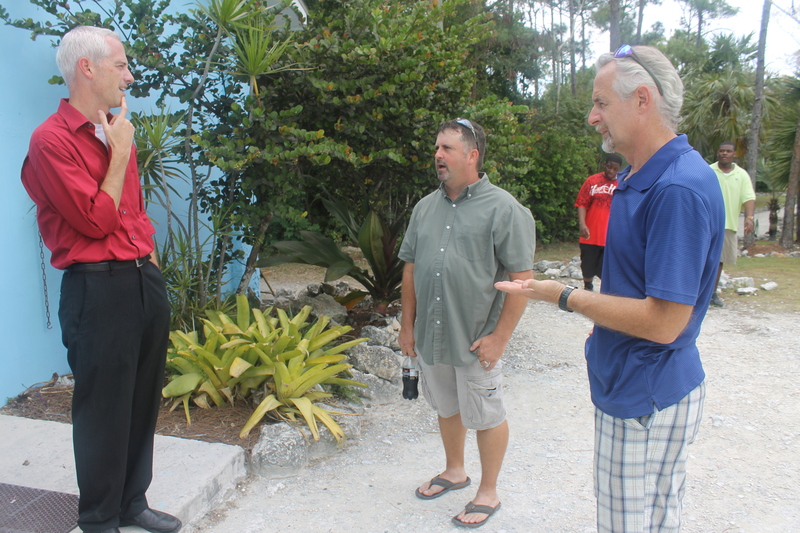 Tim was able to meet and greet several new people. 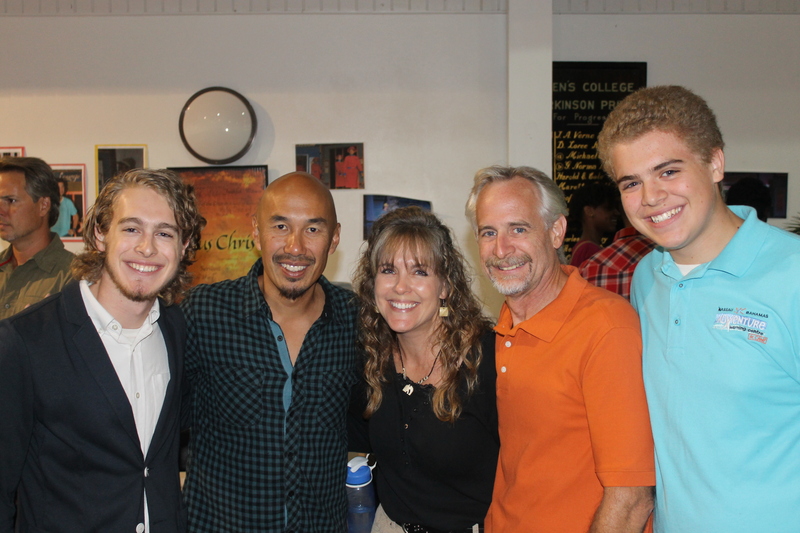 The last 2 nights we were able to attend Francis Chan meetings. 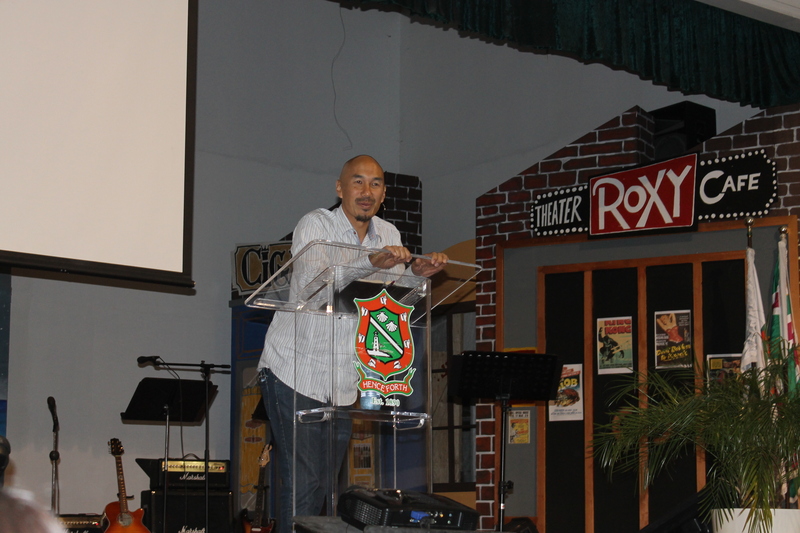 Francis Chan is an author of many books. One of those books is “Crazy Love”. 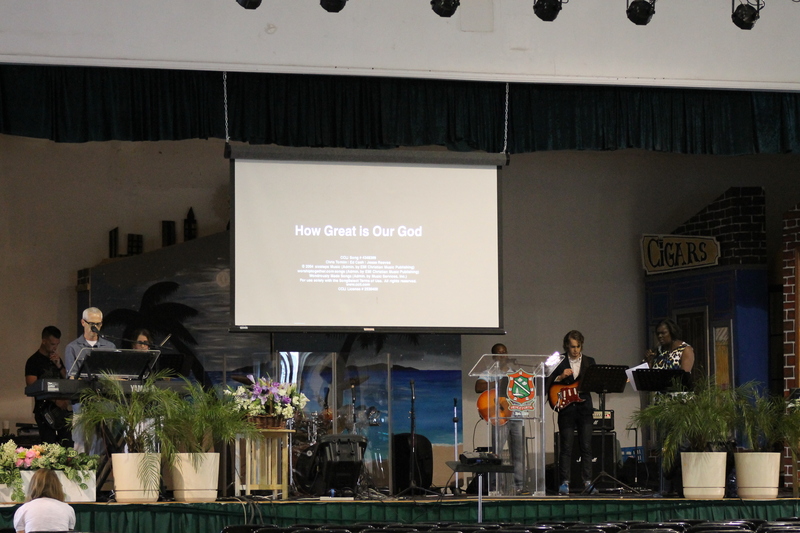 Logan was able to help serve on the worship team, and Zachary helped with the slide projection of the words. Because I had to have the boys to the church 2 hours before the meeting started, I chose seats in the second row. When it came time for the meeting to start, Francis Chan and his daughter came and sat down in the row right in front of us. For those wondering, he not much taller than I am. 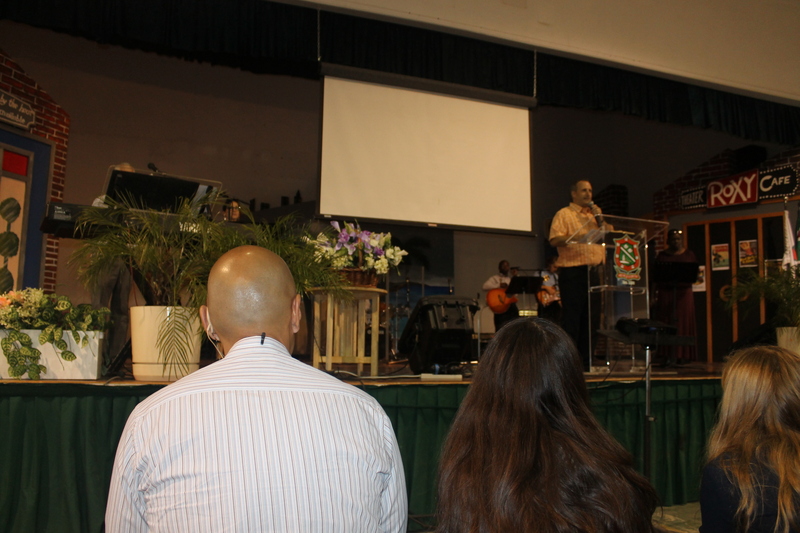 Francis spoke on Malachi 1 and Isaiah 6. God is a HOLY God. We should live in light of the fact that God is so HOLY. Night 2 of the Francis Chan meetings. Logan was able to help lead worship time along with our church worship team. 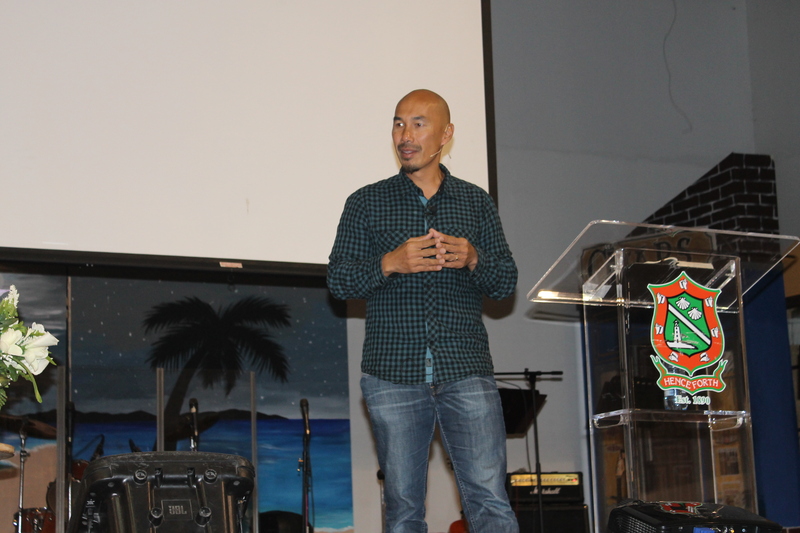 Francis Chan spoke on our “happily ever after”. Are we working for the here and now or are we working for the kingdom of God. Francis graciously posed for this picture with us. 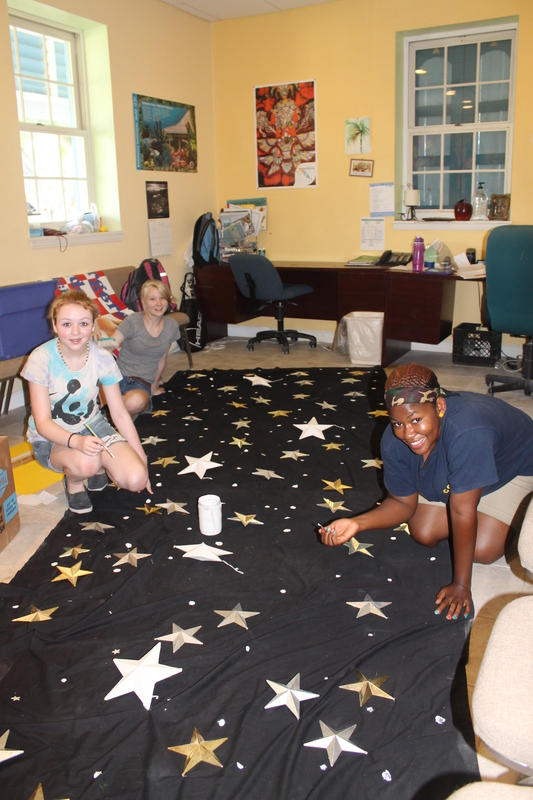 I am glad we had the opportunity to do this on Saturday because Friday Tim was unable to join us for the meeting. 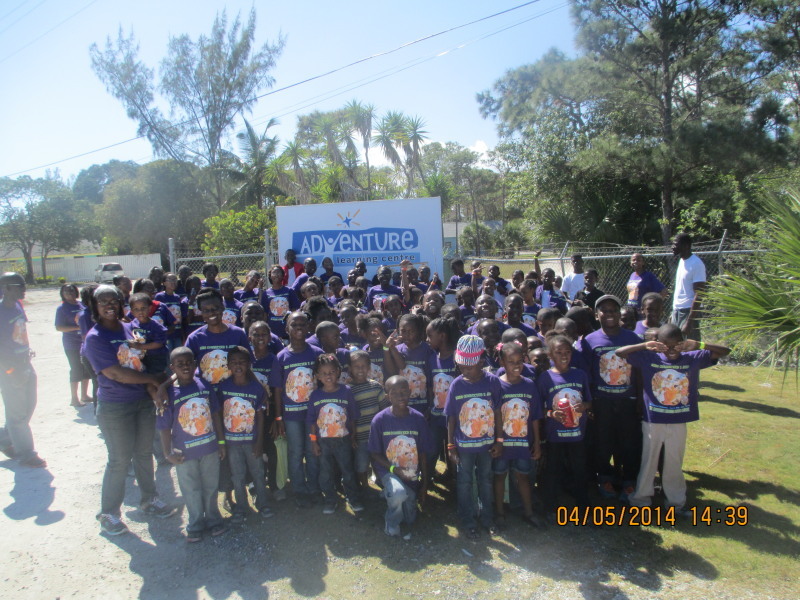 We had a group of 76 children (ages 6-13) at Camp for a weekend retreat. He was able to sneak away for a few hours on Saturday. 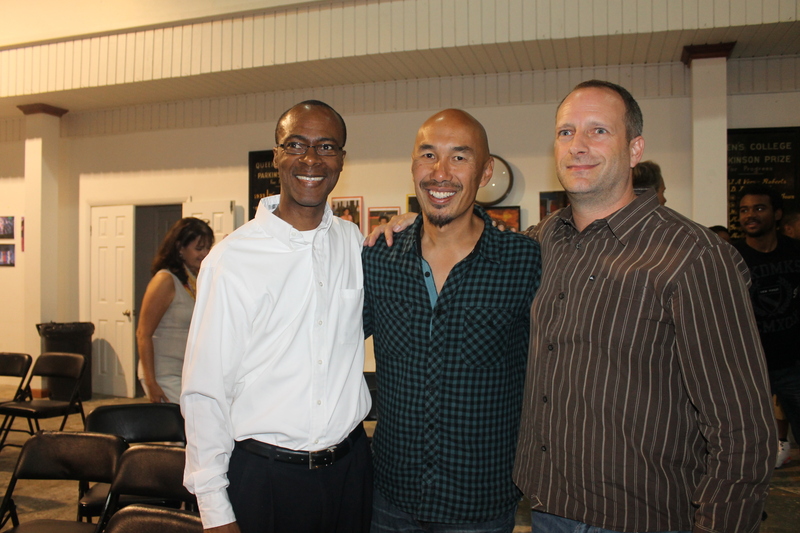 Pastor Cedric Moss of Kingdom Life Church (on left) and Pastor Bryn McPhail of St. Andrews Presbyterian Kirk (on right) were were the planners and organizers of the meetings with Francis Chan. 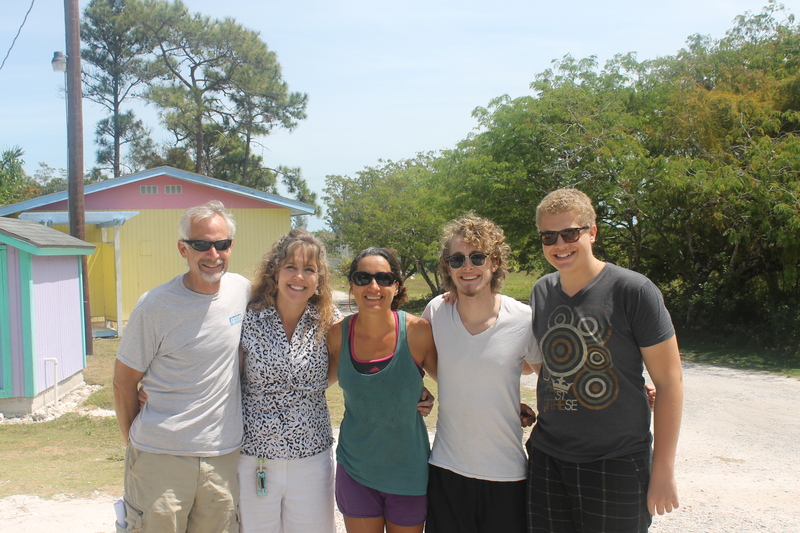 This is the Pinder family. 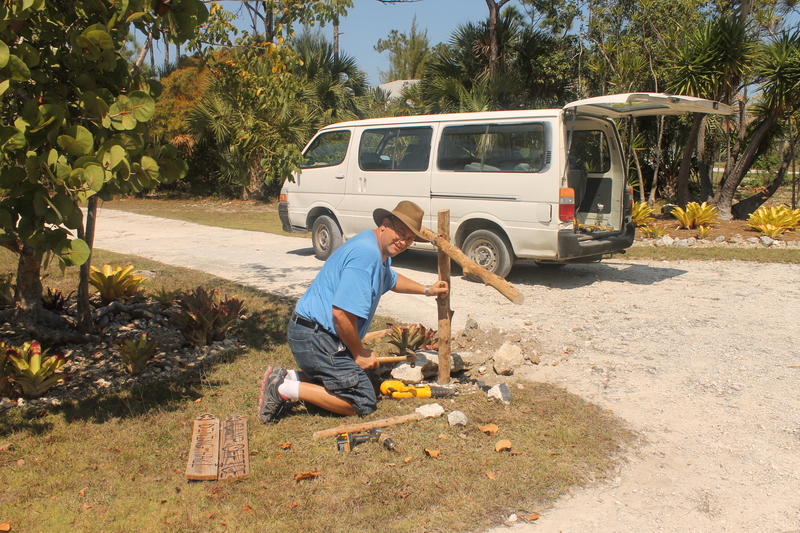 Chris is the youth pastor at a church on Abaco (a family island). 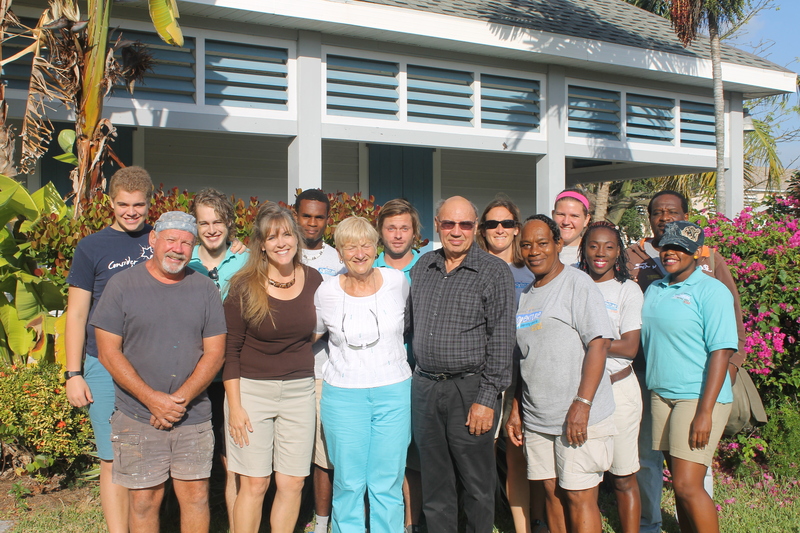 He is friends with Francis and was instrumental in getting Francis to come to Nassau. Chris also played on the worship team with our church musicians. 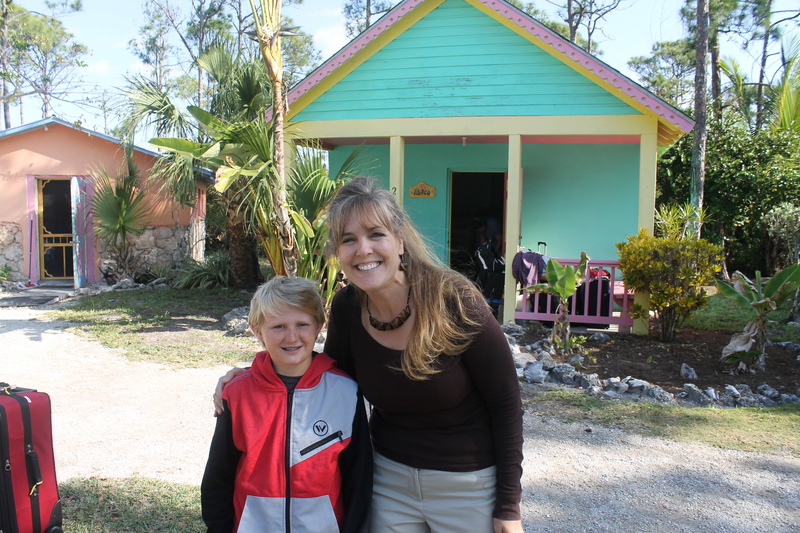 We hope to make it over to Abaco some day to see the island and reconnect with this family. 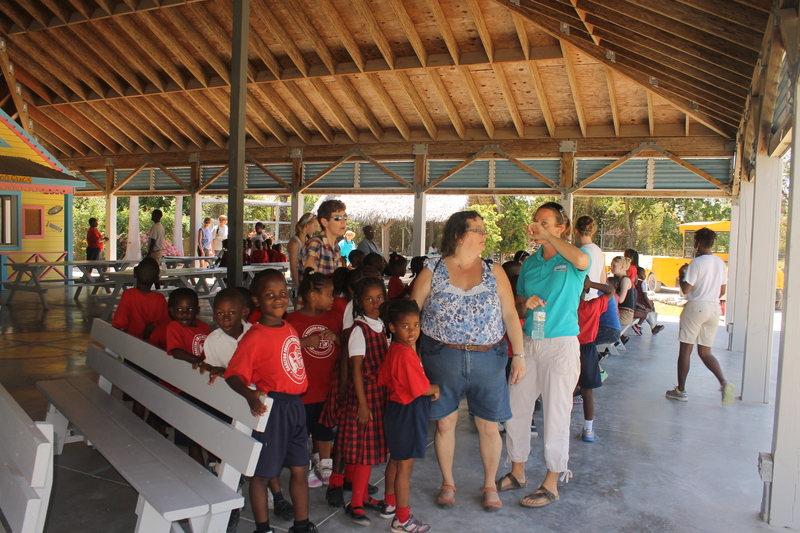 At Camp this past weekend we had 70+ children and their leaders from a group of Bahamian churches. They were with us for their retreat. 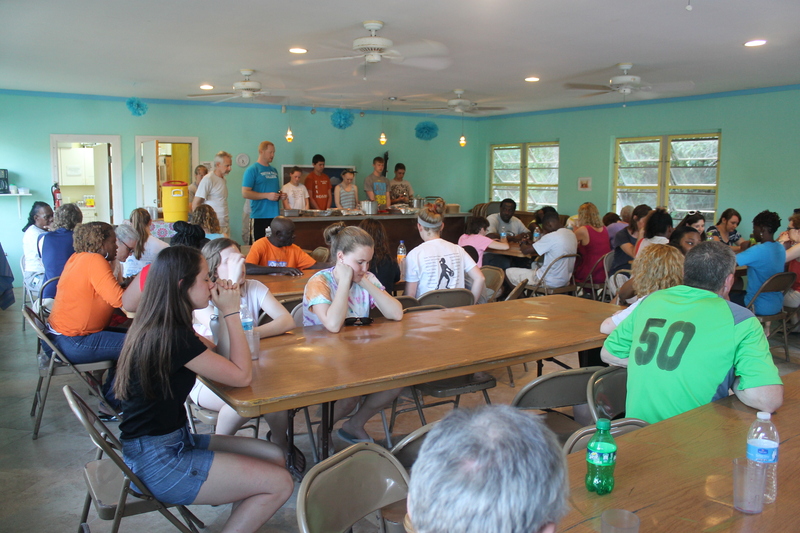 It was so much fun hearing the laughter and seeing the children playing around camp. Planning meeting. It used to be just Tim and me discussing menus, shopping, cleaning, schedules, etc for upcoming mission teams coming to ALCamp. We are so thankful to have help with these tasks. 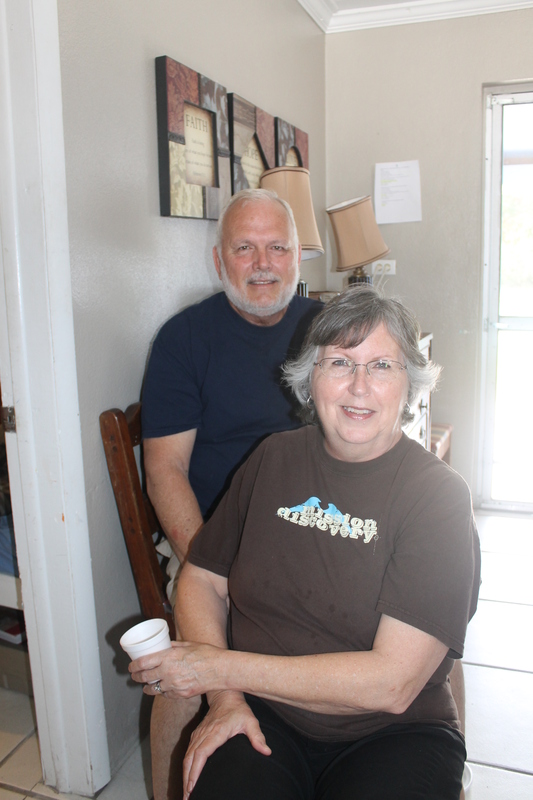 Bob and Judi have been such a huge blessing. 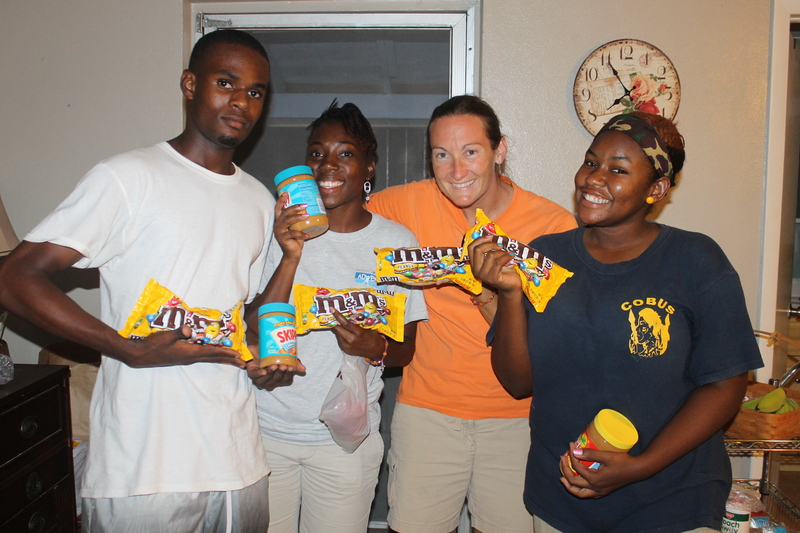 Their help with the food service and housekeeping here at camp has freed us up to focus more on the management, guest services (which includes hosting guests, connecting with mission teams and Bahamian ministries and pastors/youth workers via phone and email, making arrangements for guests when they are here, logistics, etc), site planning/building projects, repair/maintenance projects (there are a lot of repairs), and marketing of the Camp. 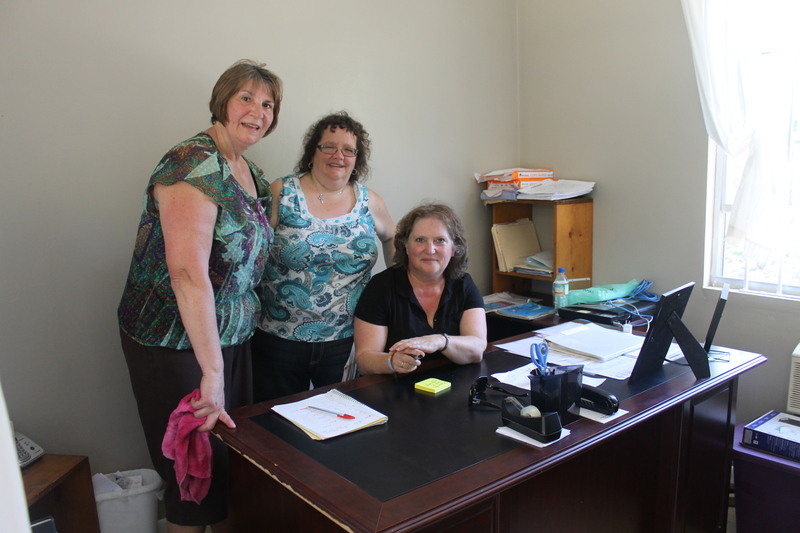 There is a lot of work that goes on behind the scenes. 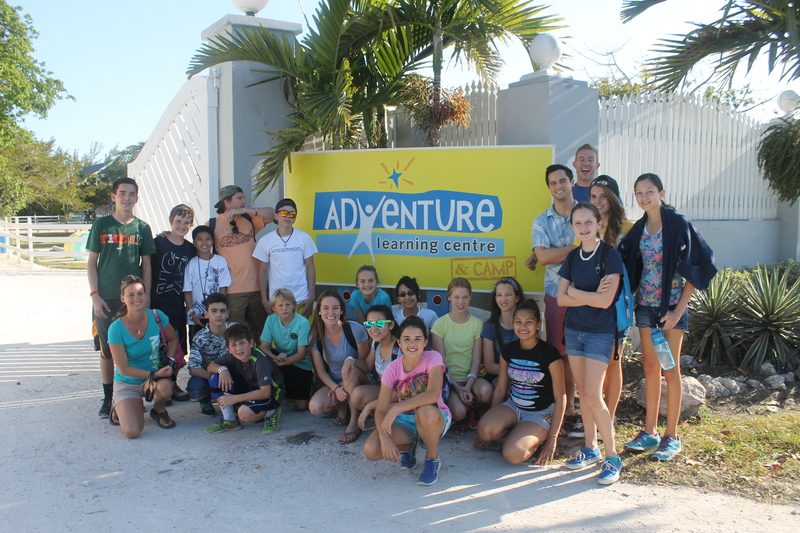 We have a group of 36 coming in on Friday from New York. We are looking forward to serving them. 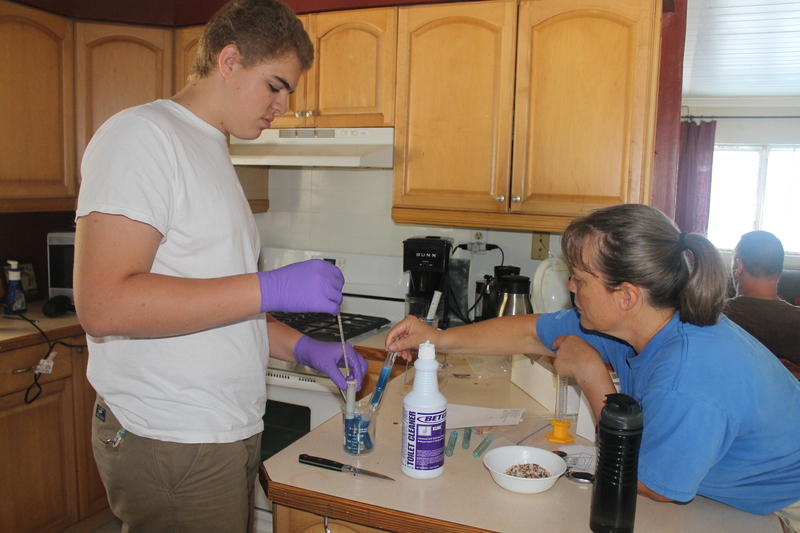 Judi working with Zachary on his school chemistry experiment. Judi studied food science. Hallelujah! For the first time in 1 1/2 years, we can honestly say that we are nearly caught up and up to date with school work. 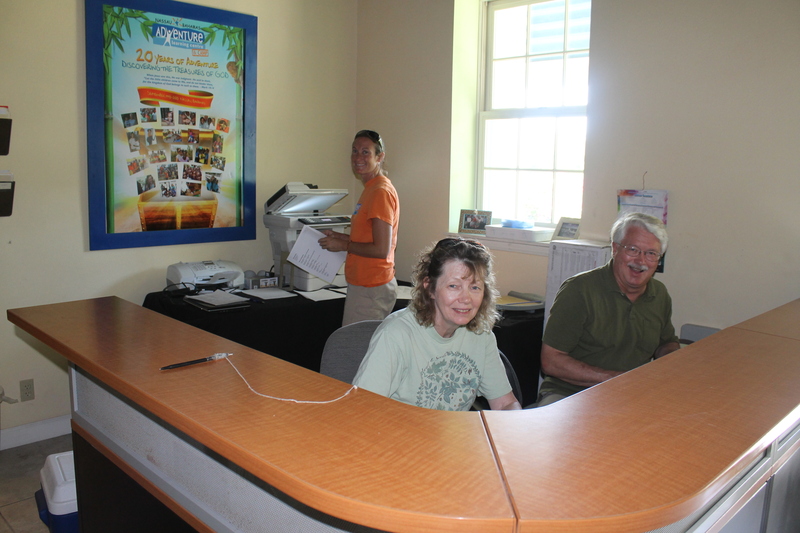 Thanks to Bob and Judi being here to help out at camp, I have been able to perform my priority calling, and that is homeschool mom. *Praise the Lord that I (Mindy) have had time to work on homeschooling work with Zachary. 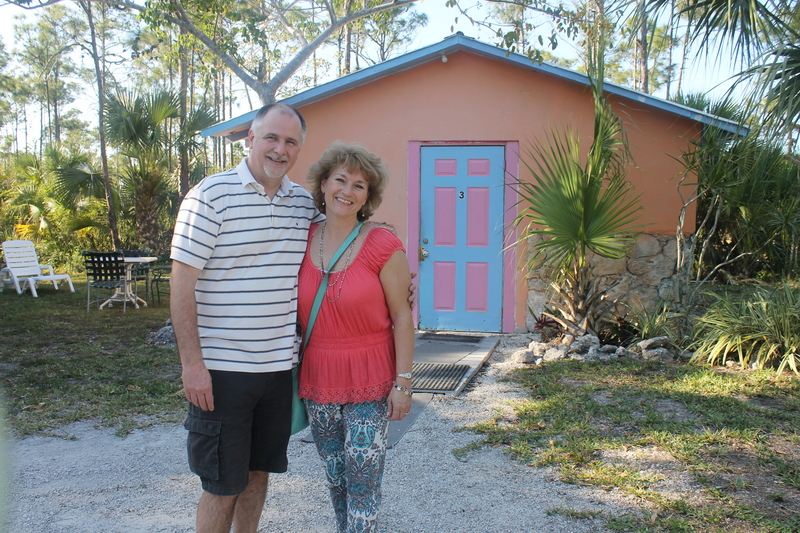 Thank you for your time and interest in our lives and ministry work. Please stay in touch. We love hearing from you!